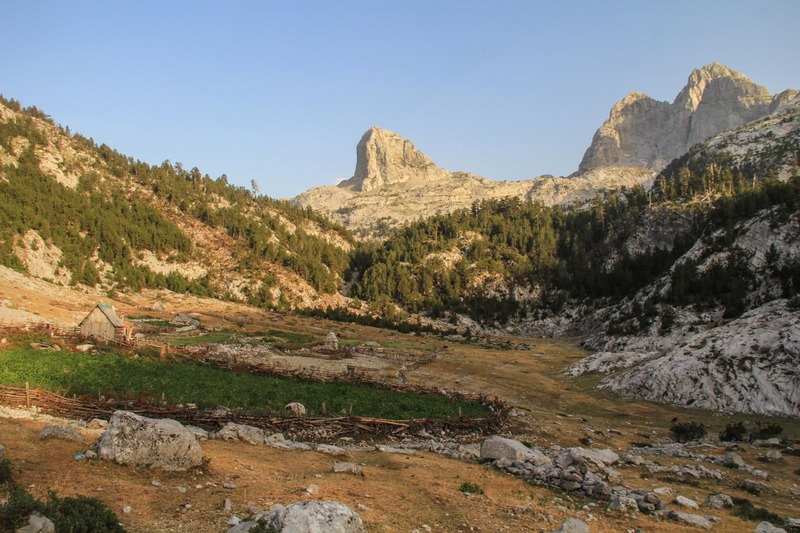 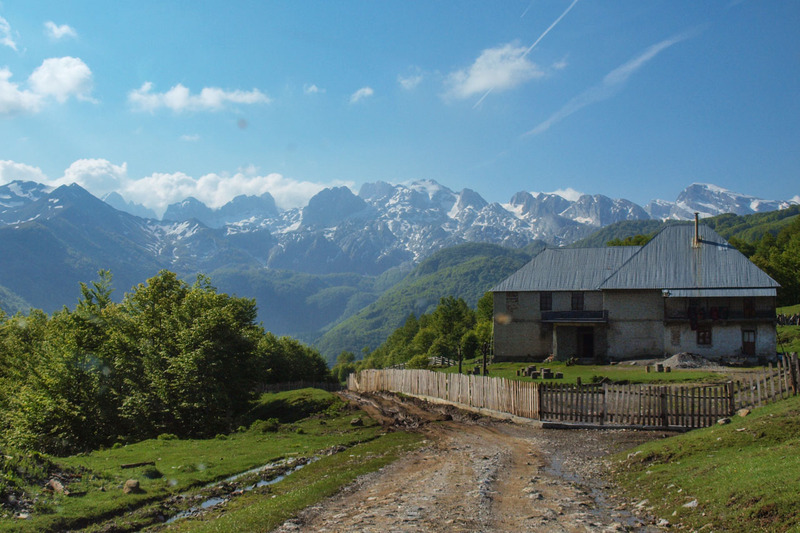 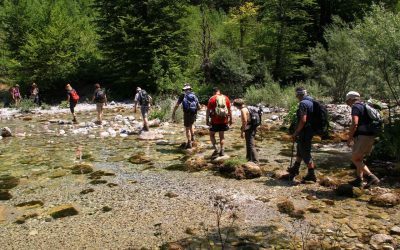 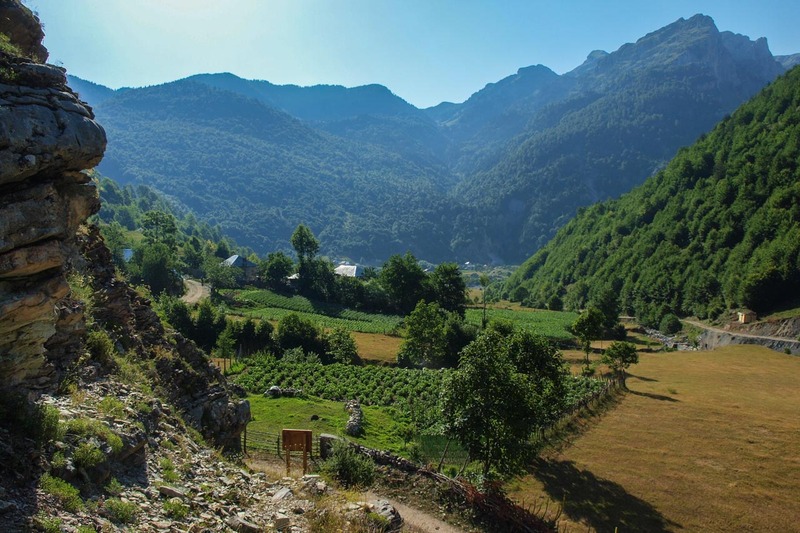 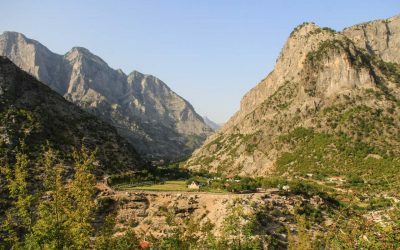 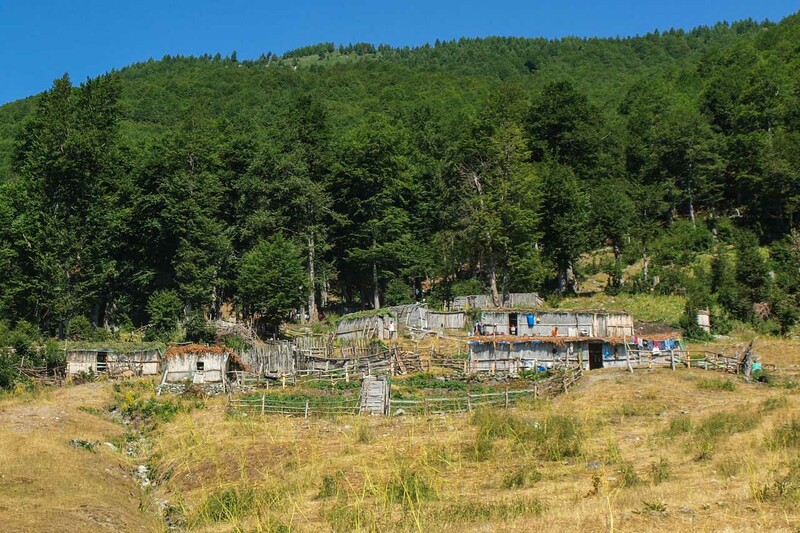 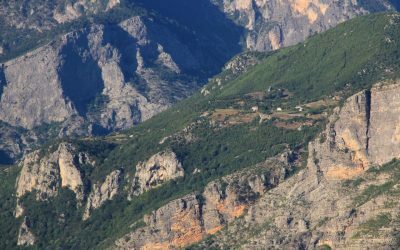 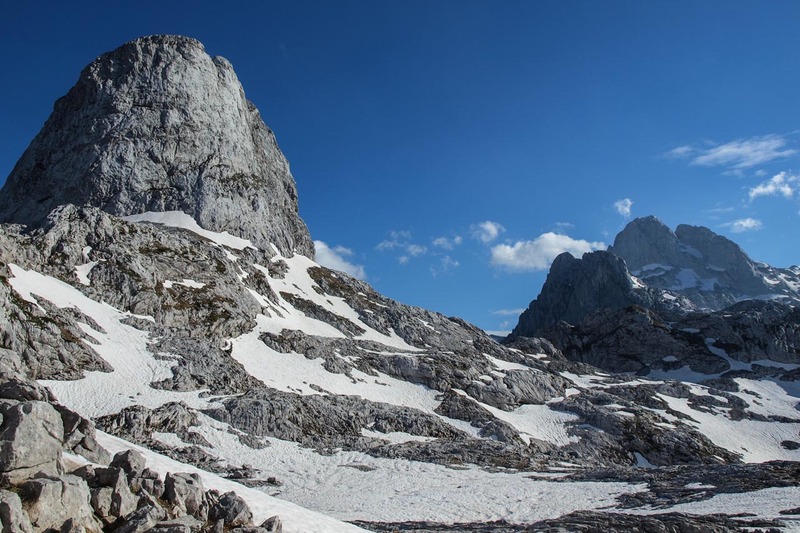 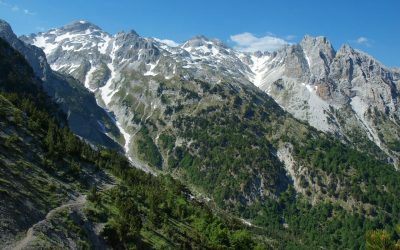 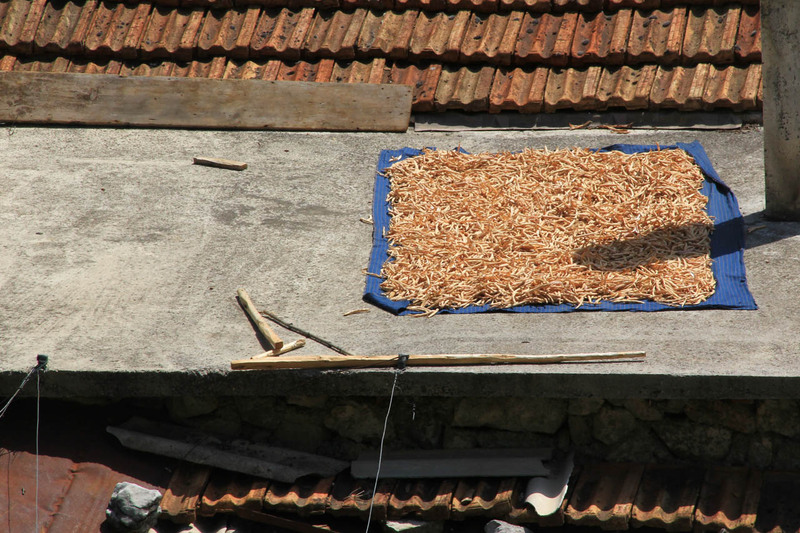 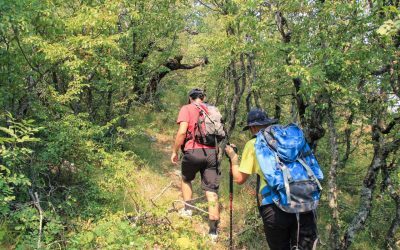 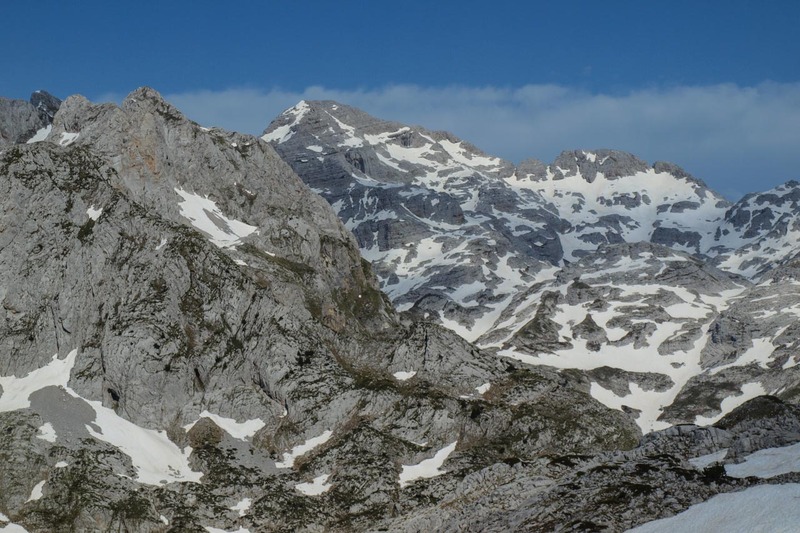 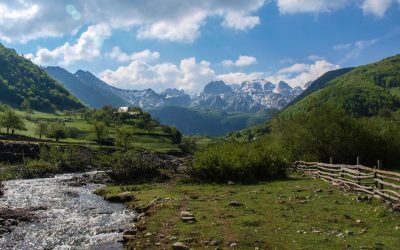 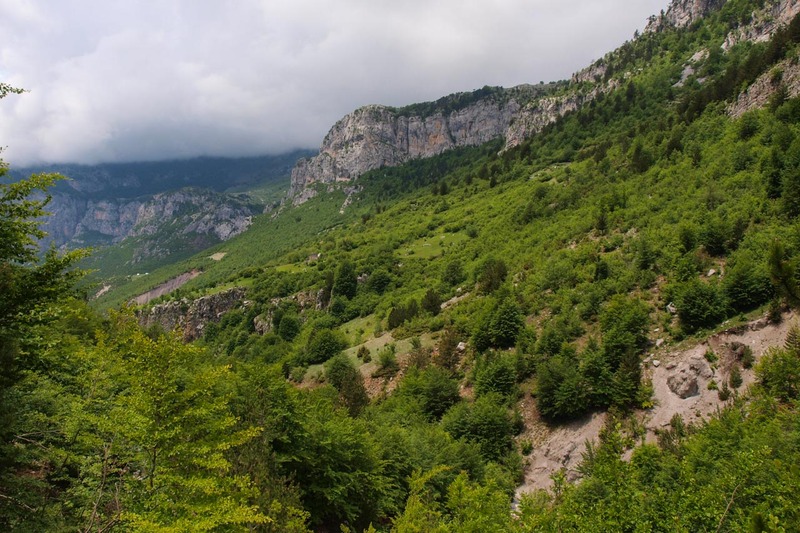 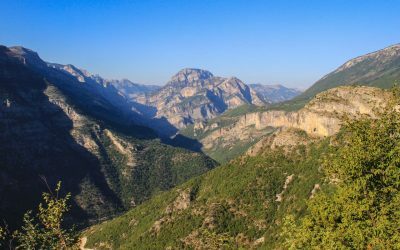 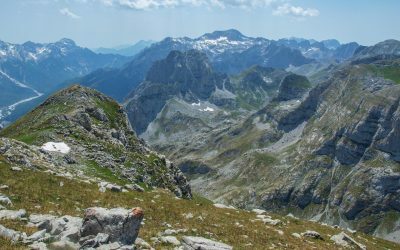 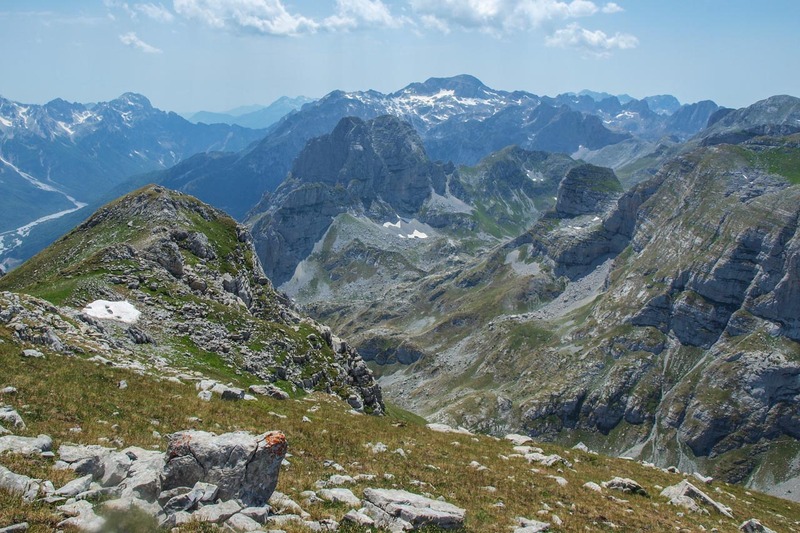 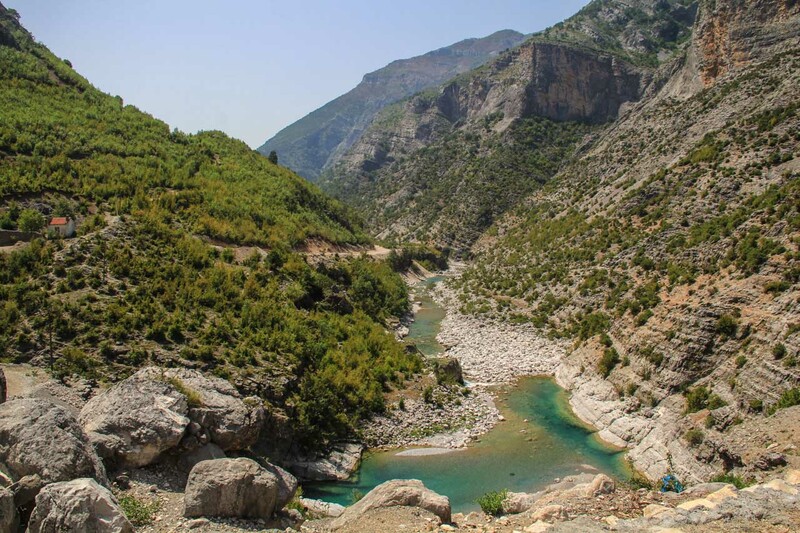 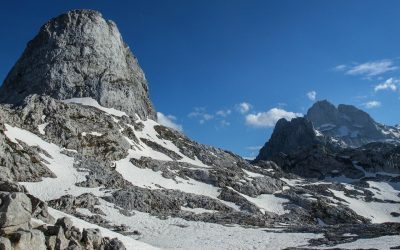 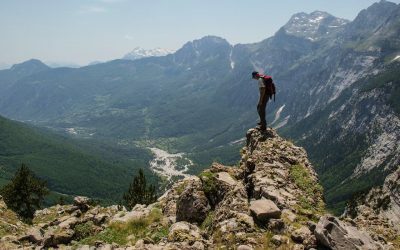 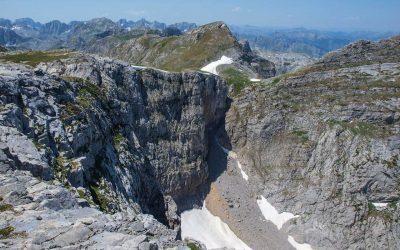 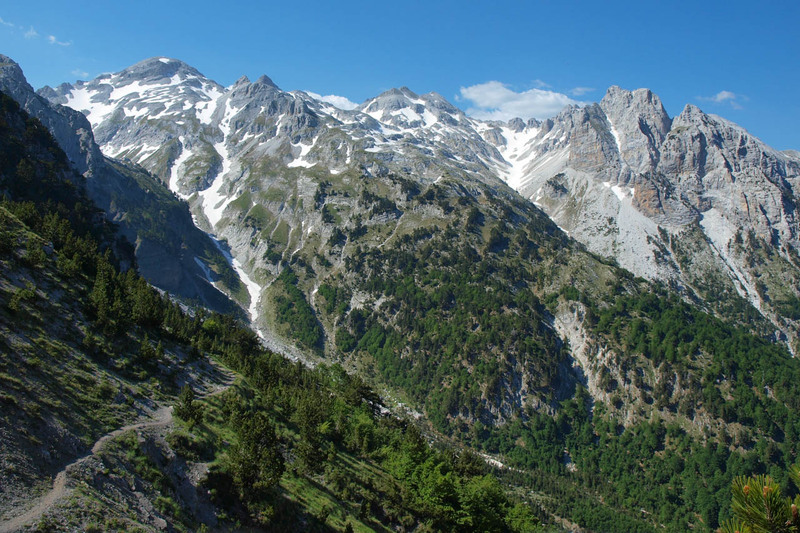 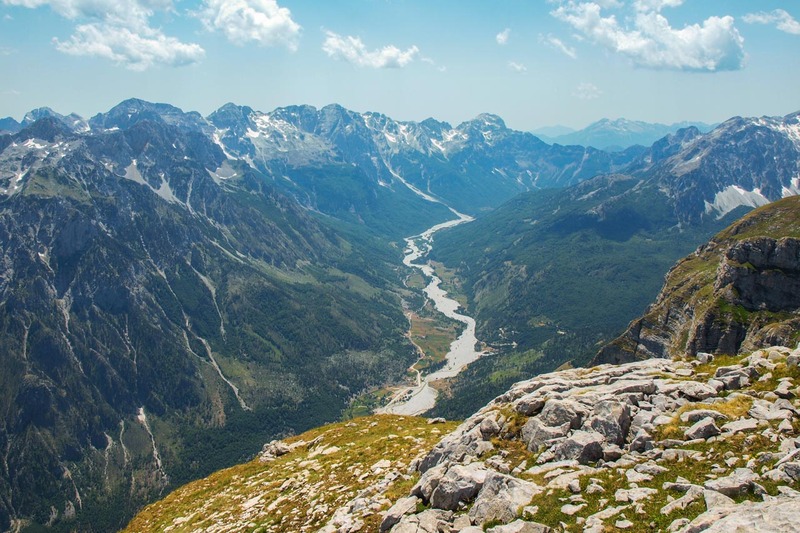 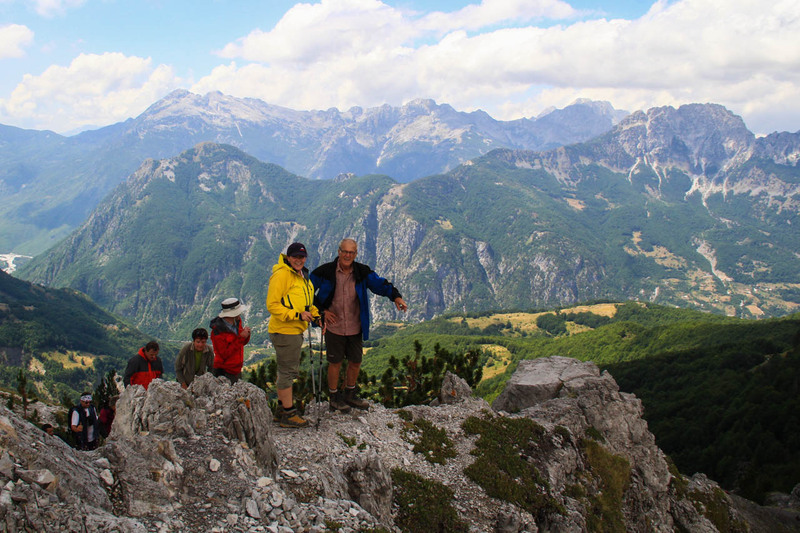 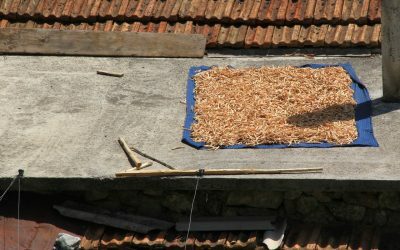 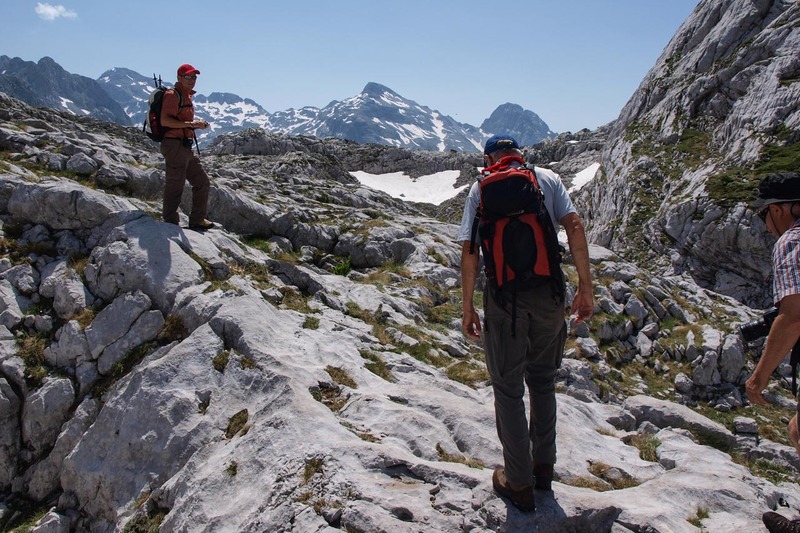 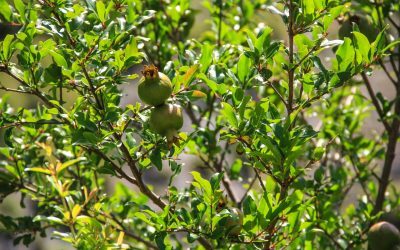 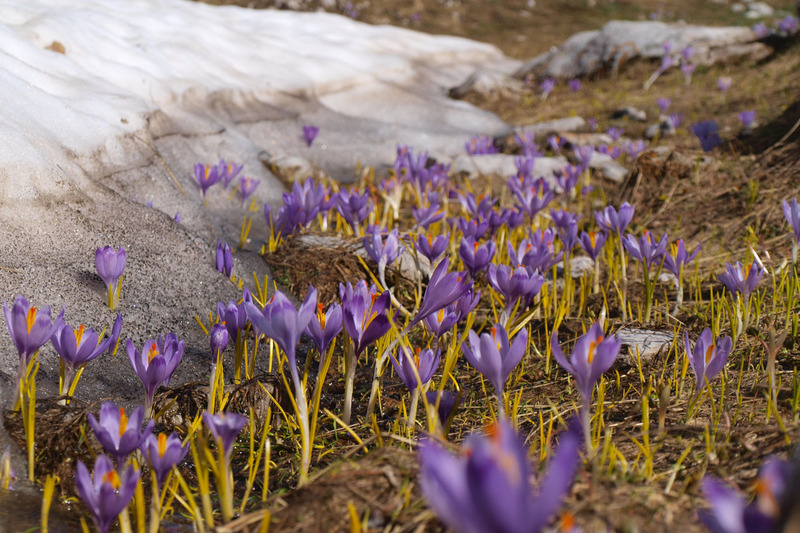 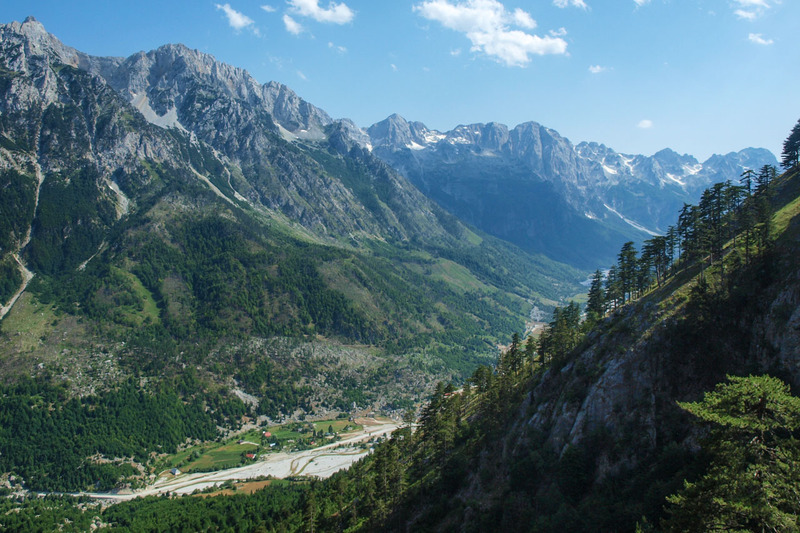 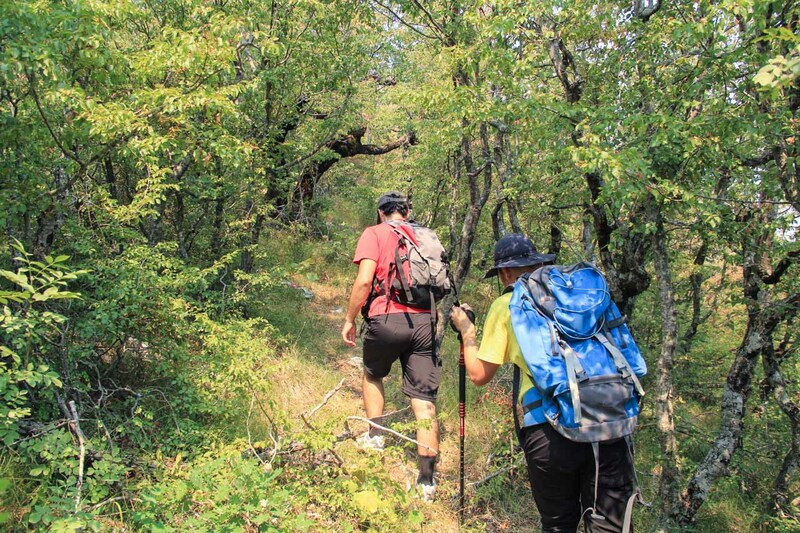 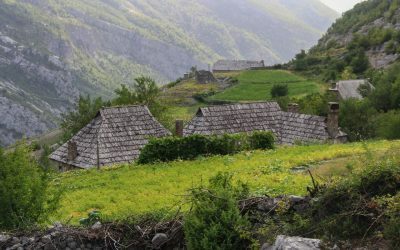 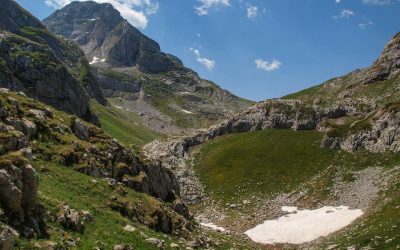 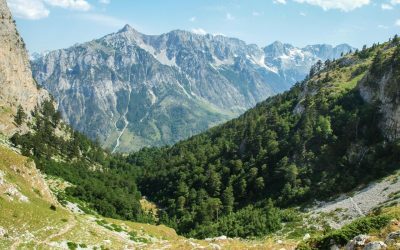 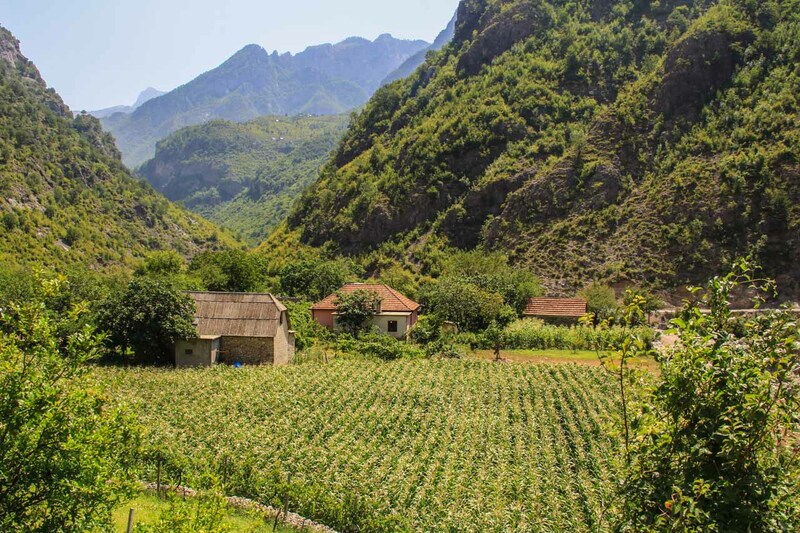 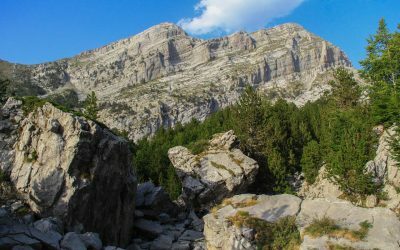 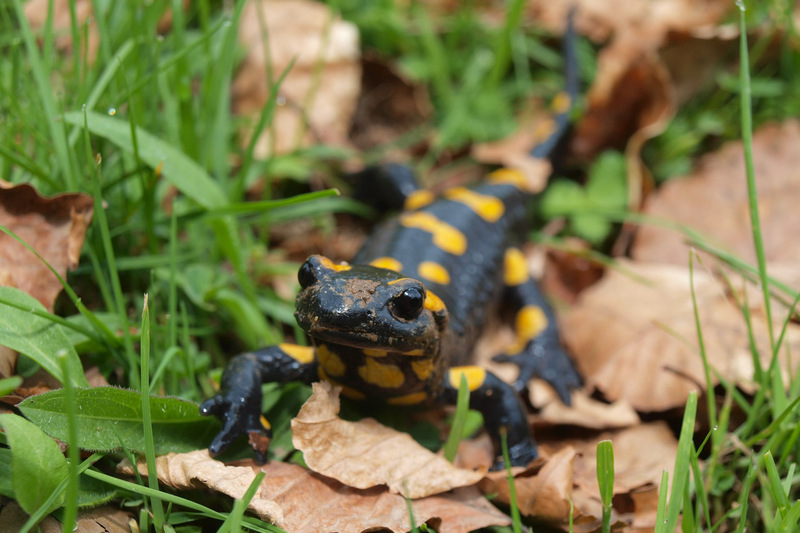 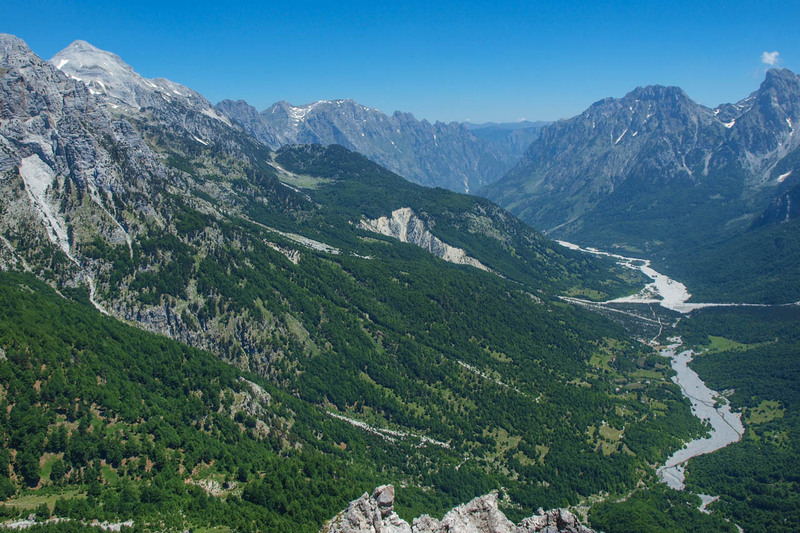 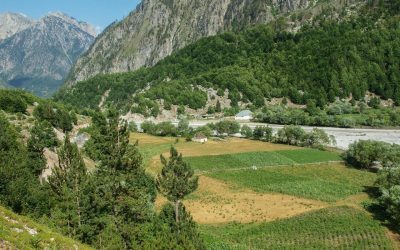 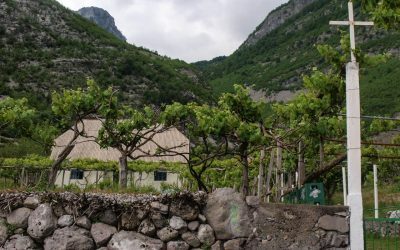 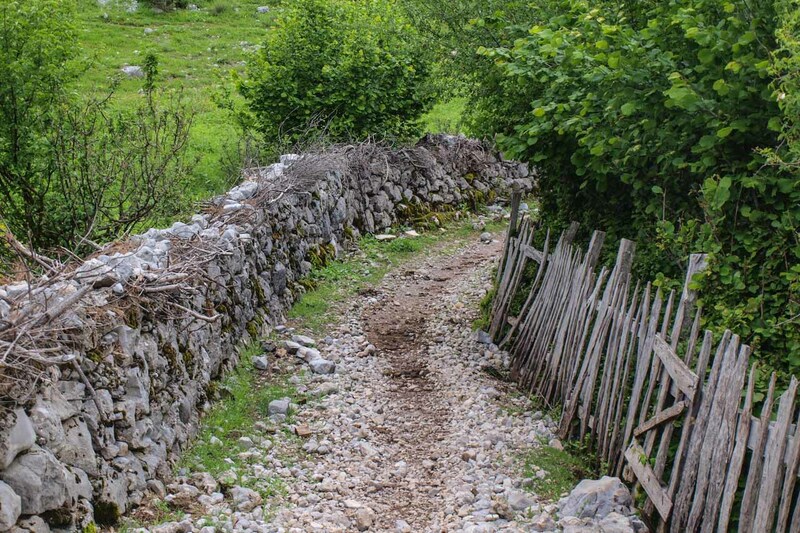 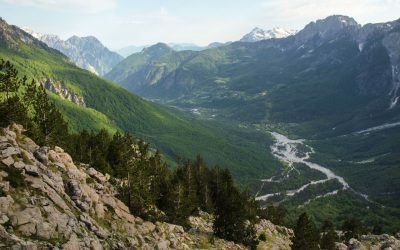 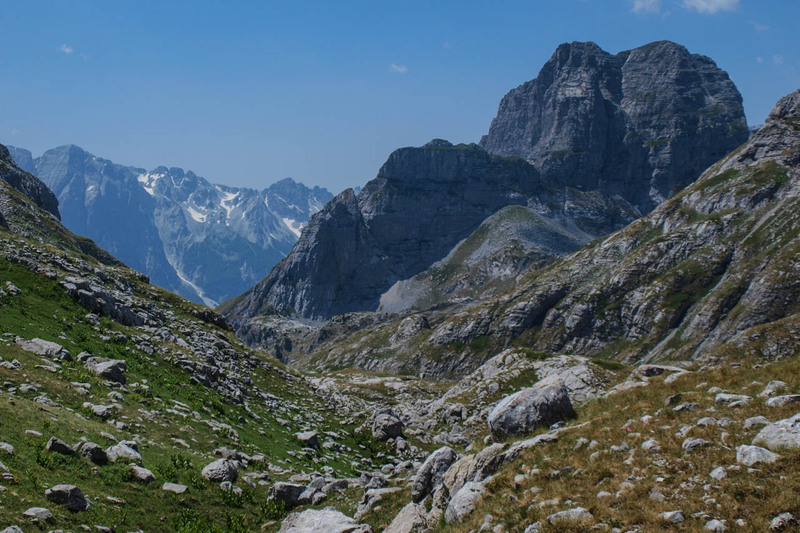 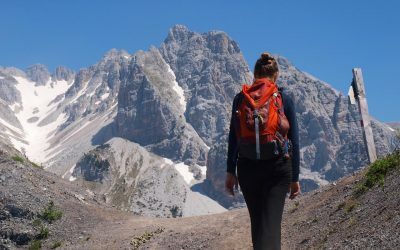 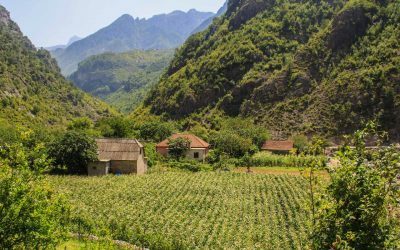 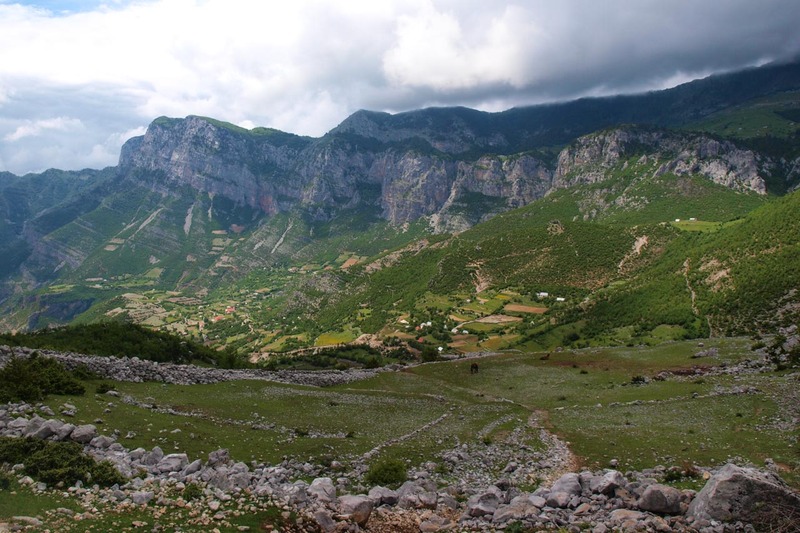 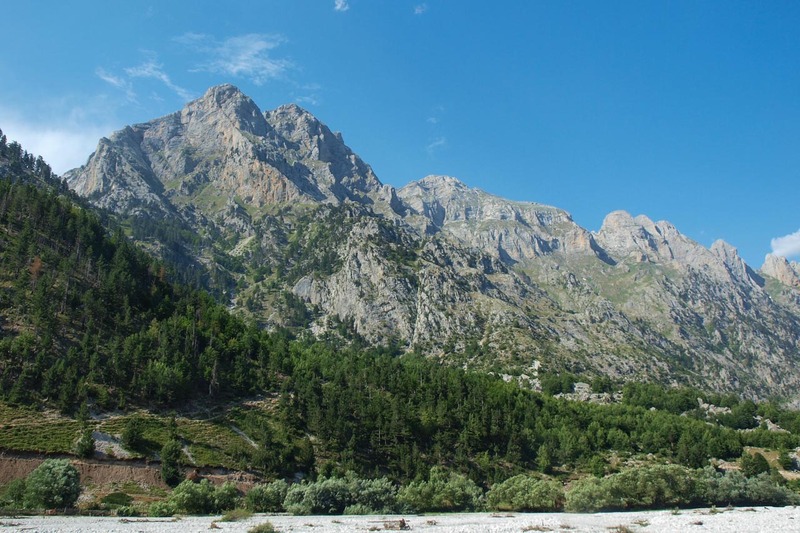 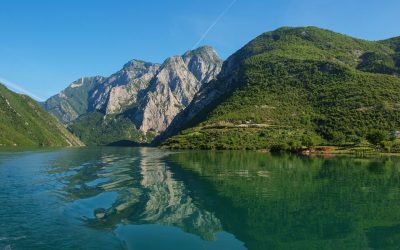 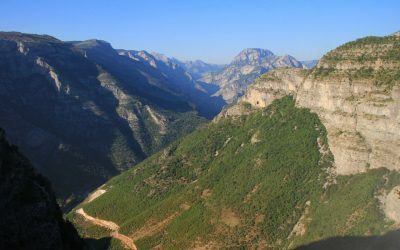 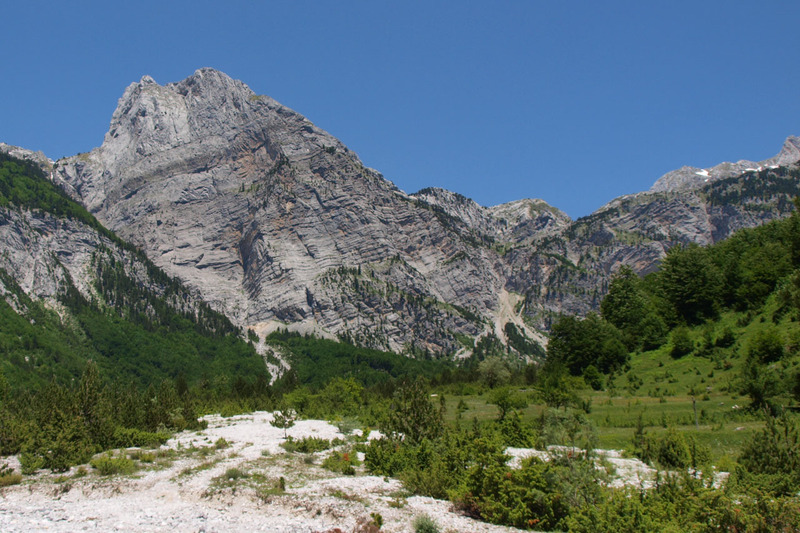 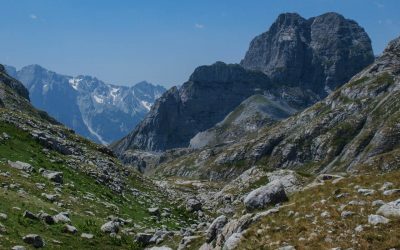 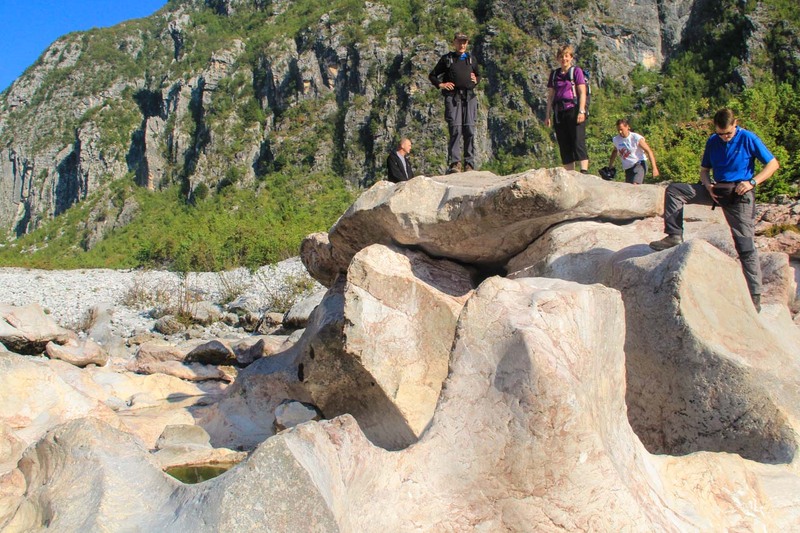 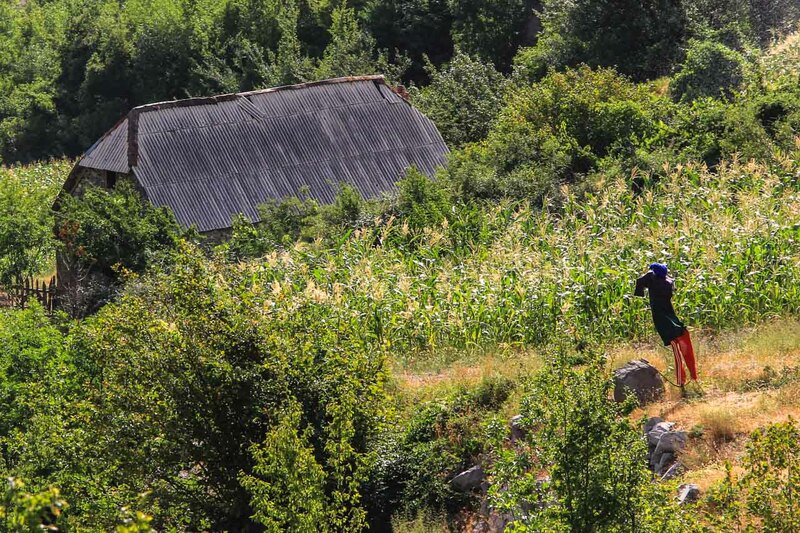 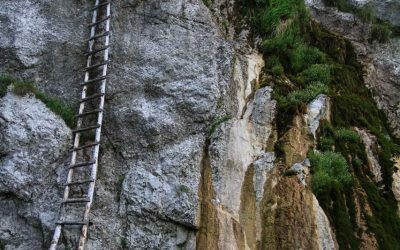 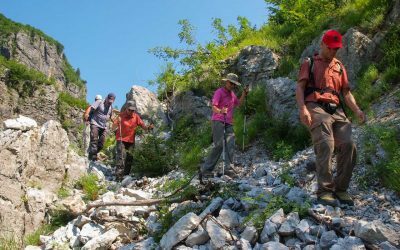 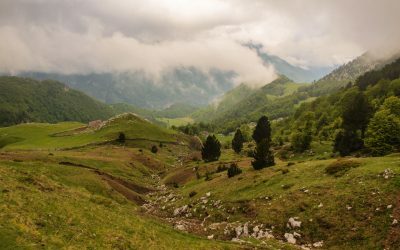 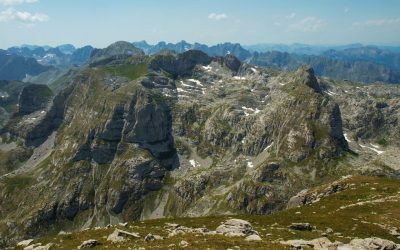 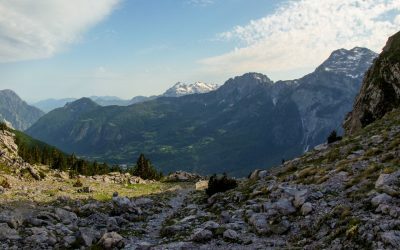 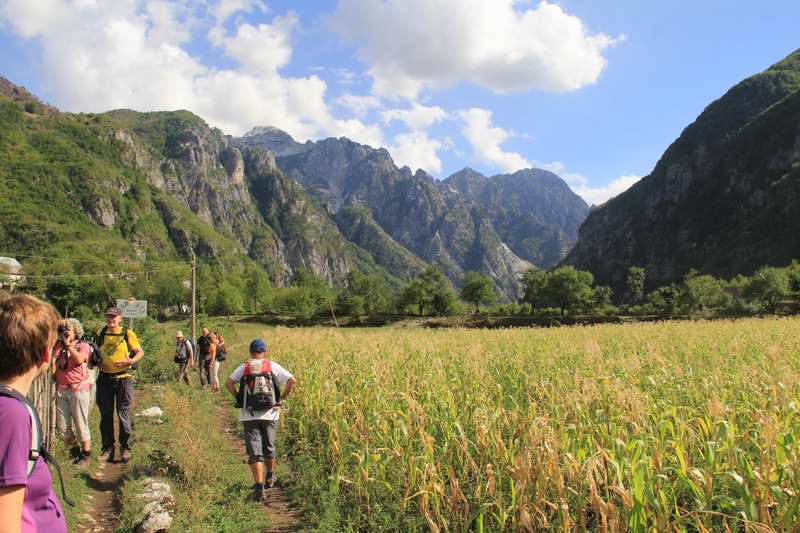 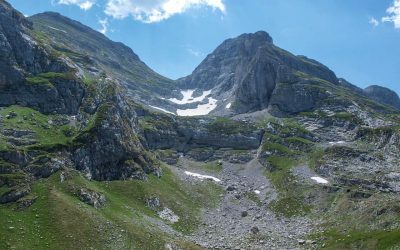 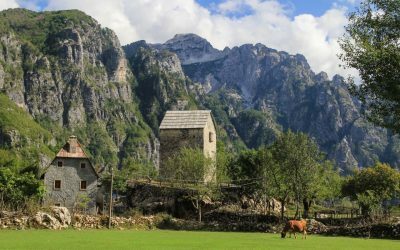 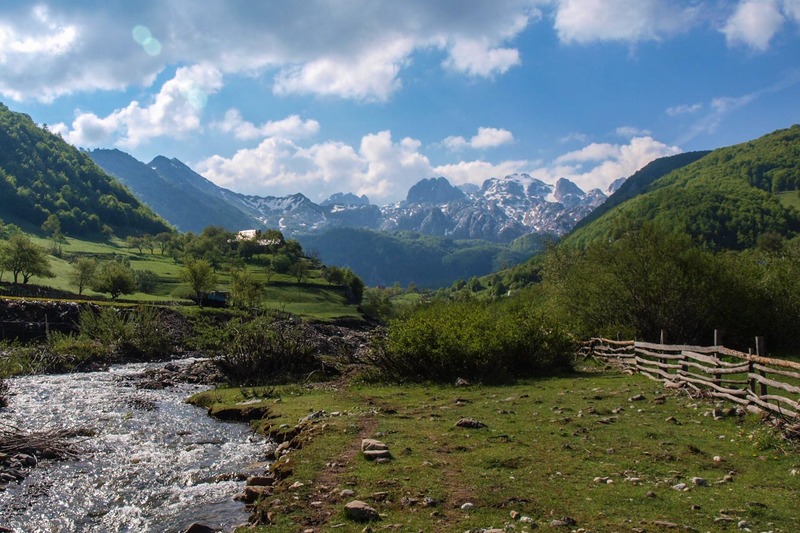 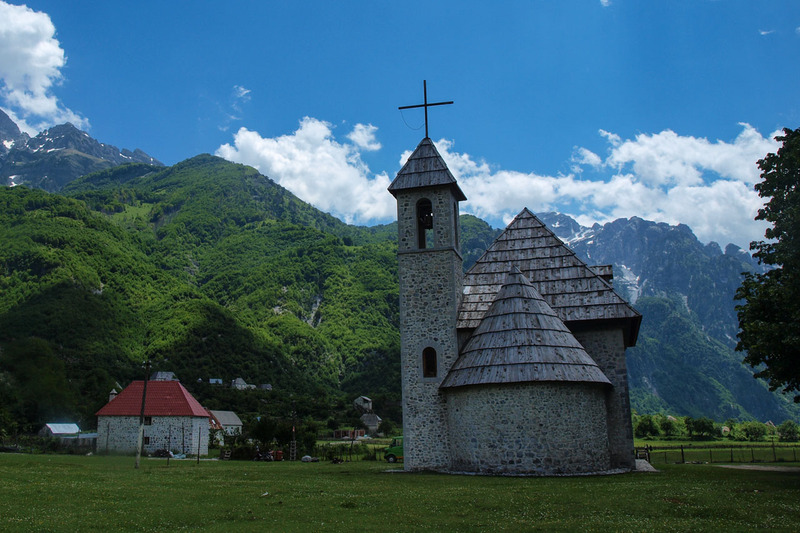 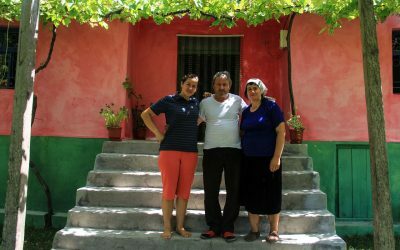 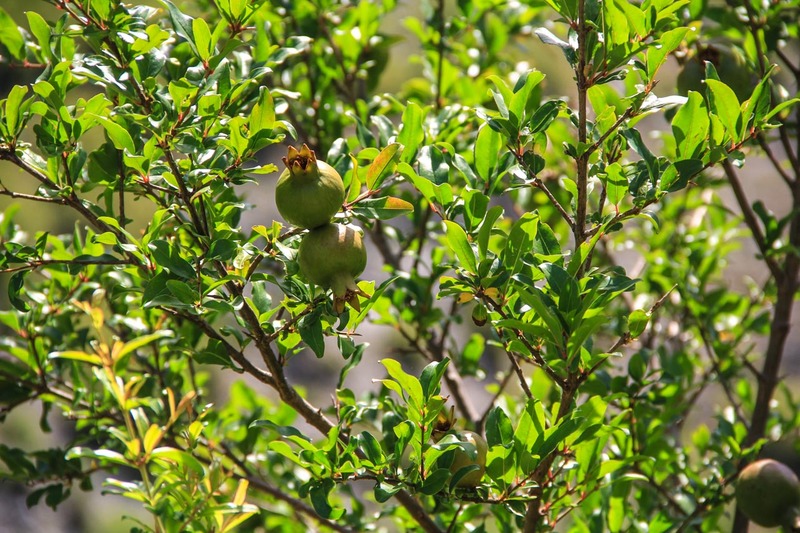 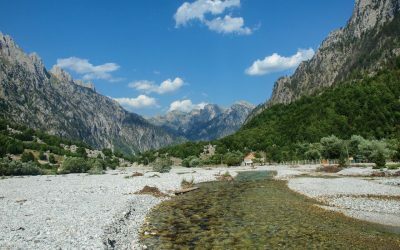 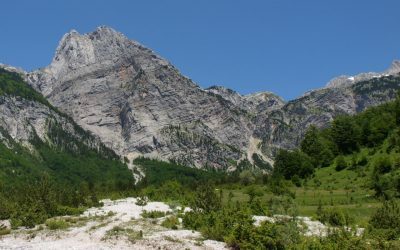 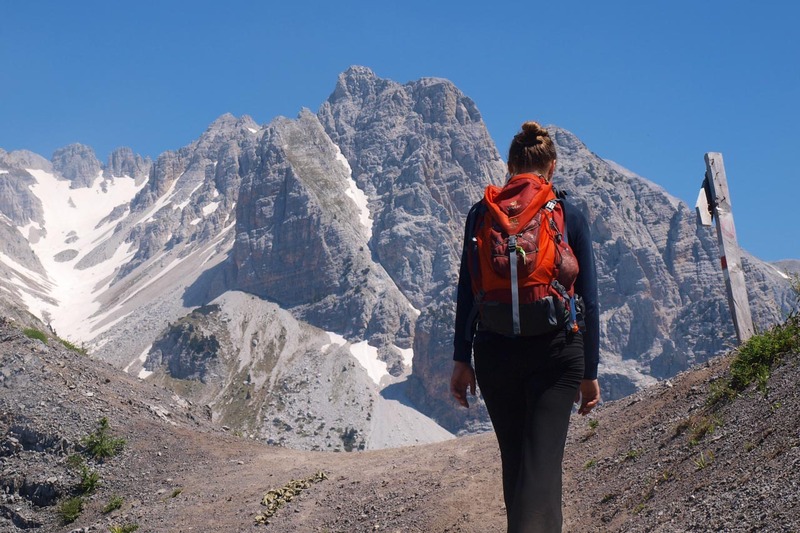 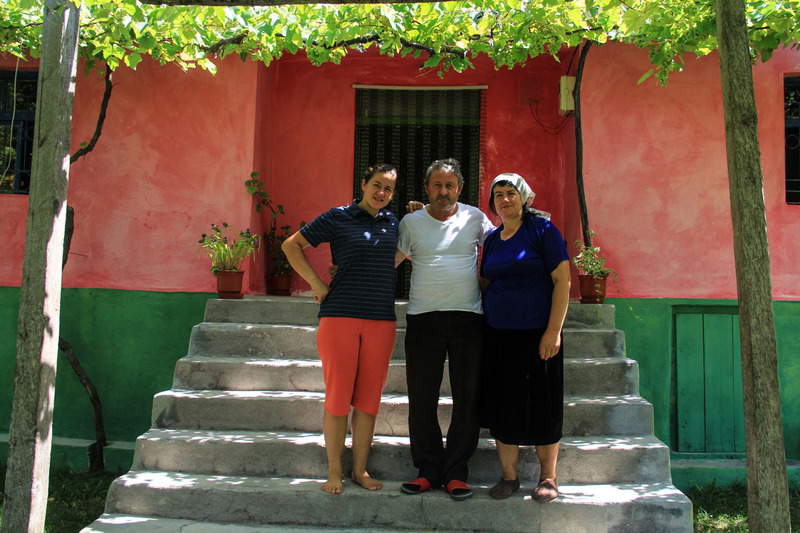 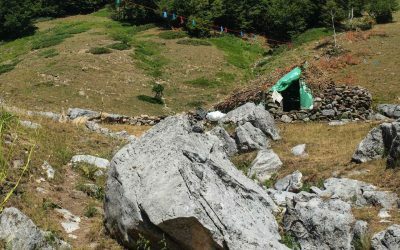 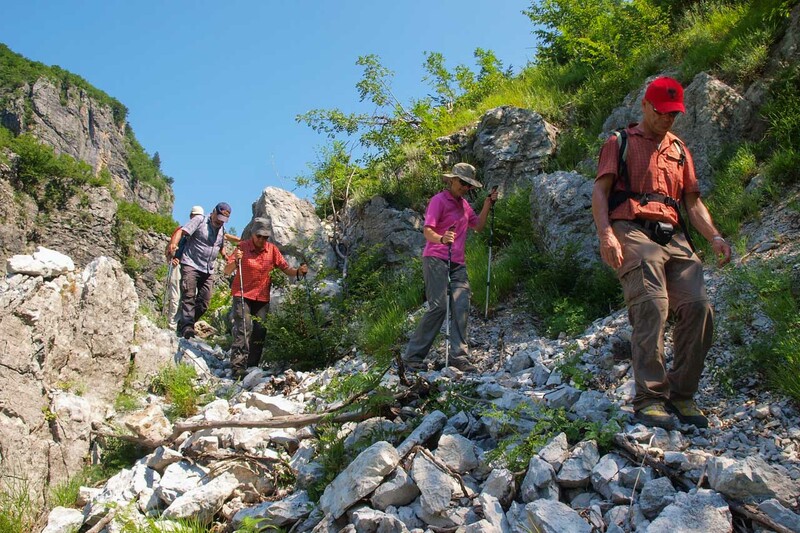 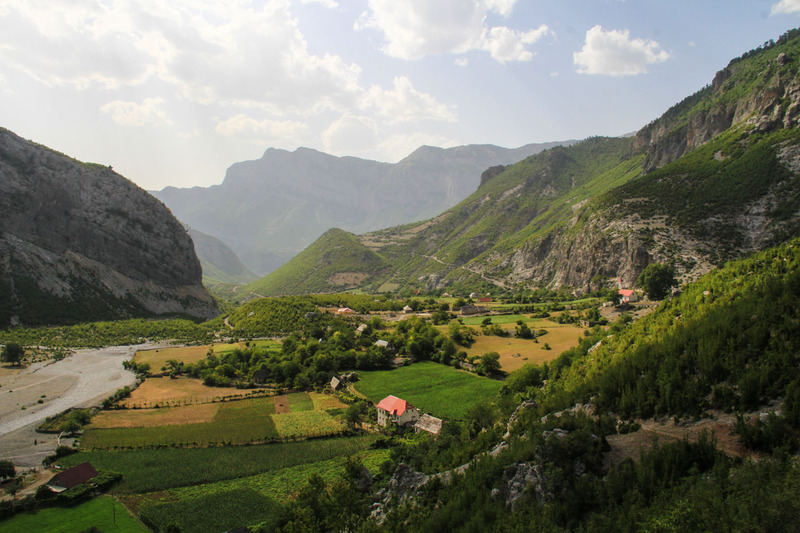 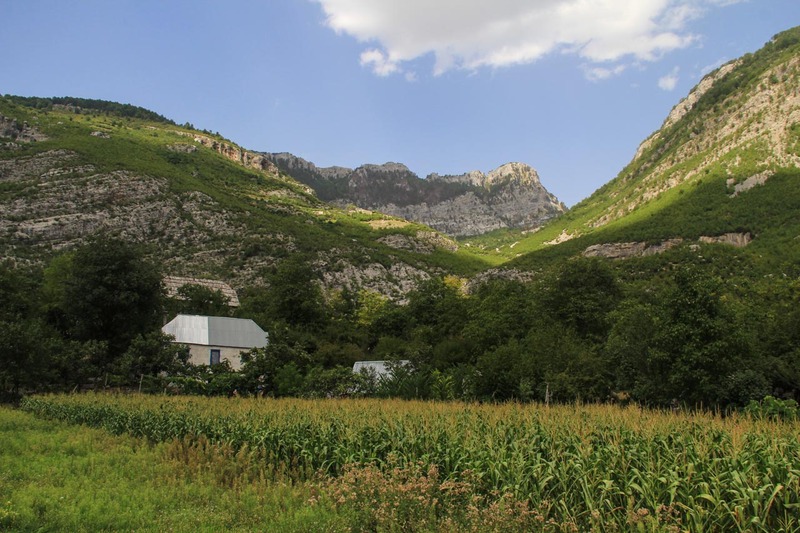 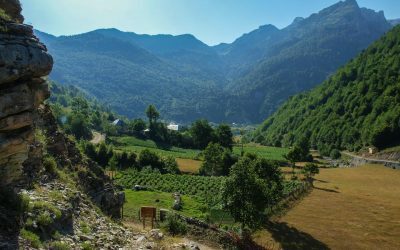 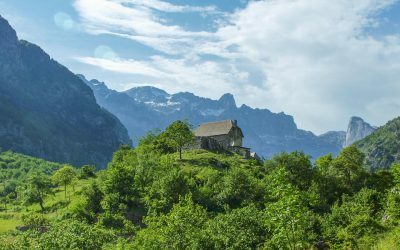 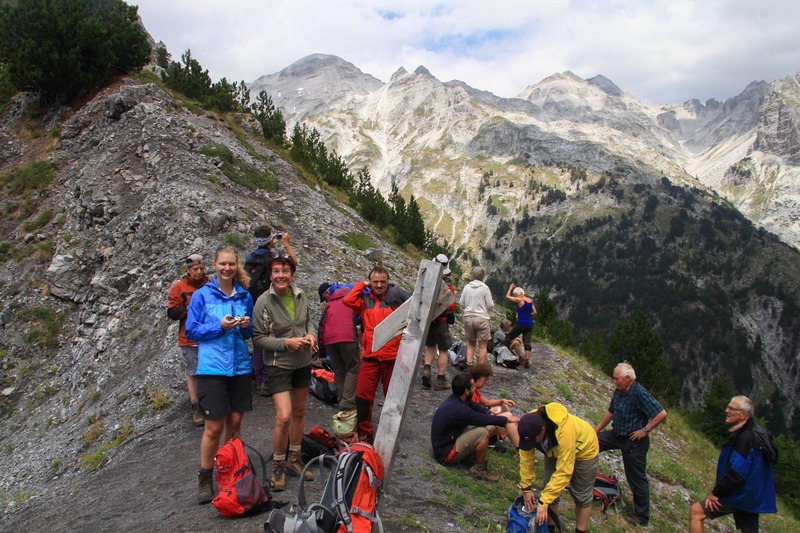 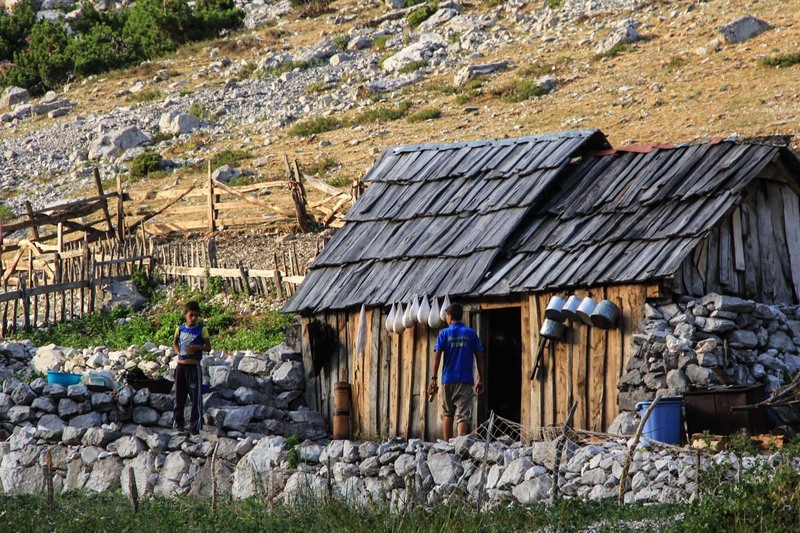 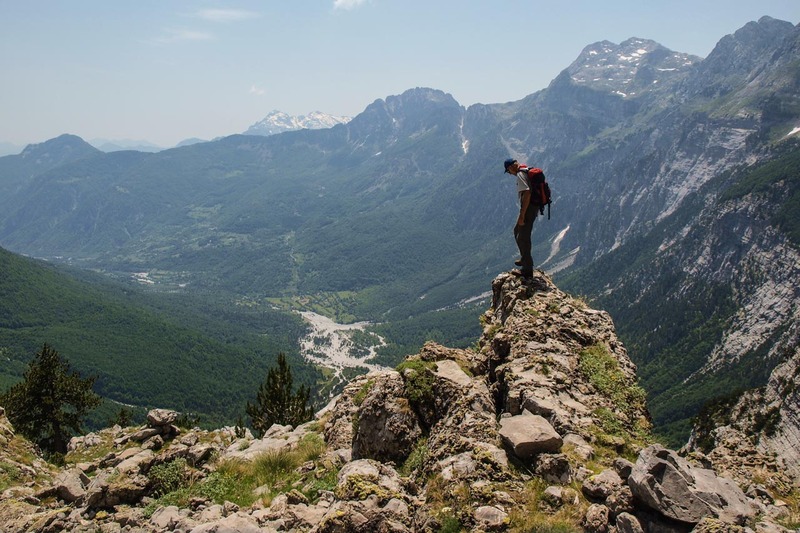 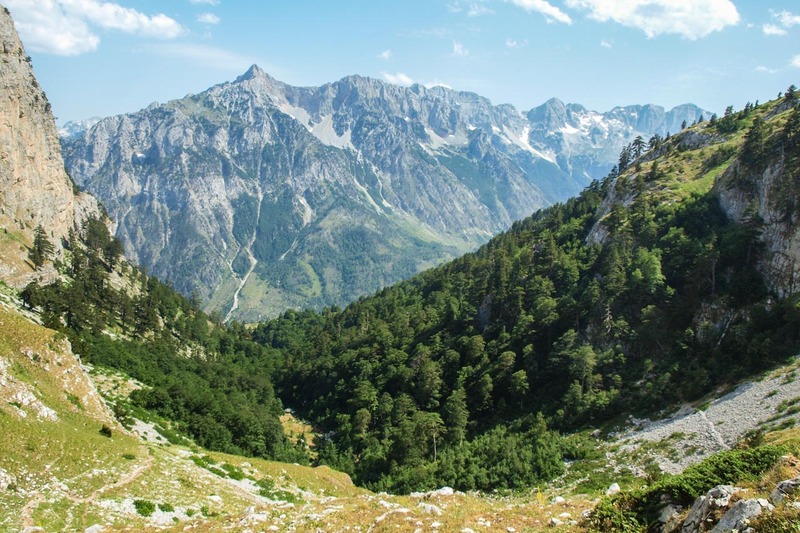 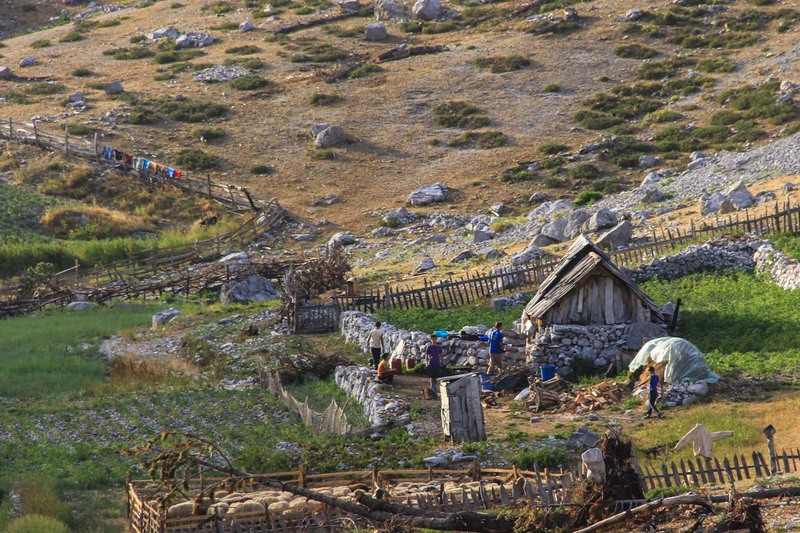 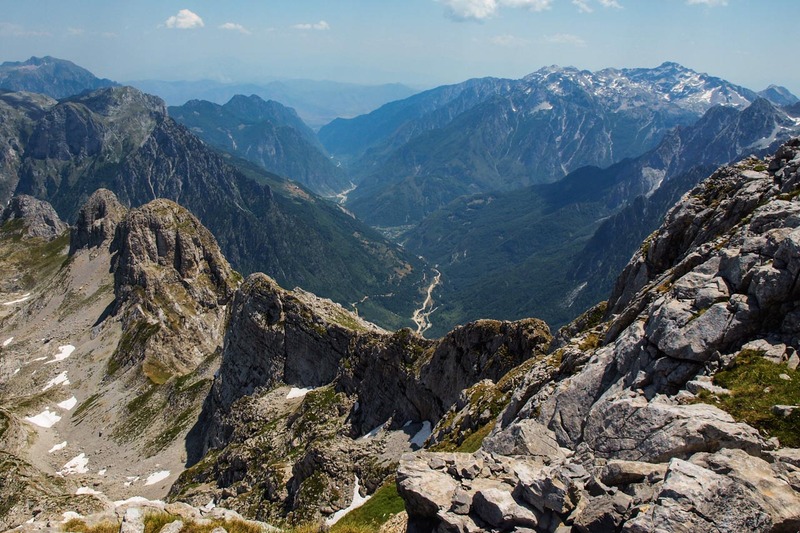 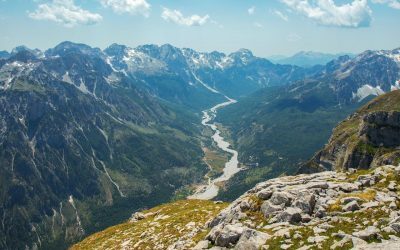 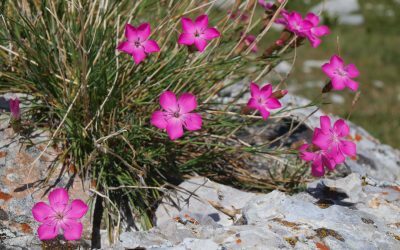 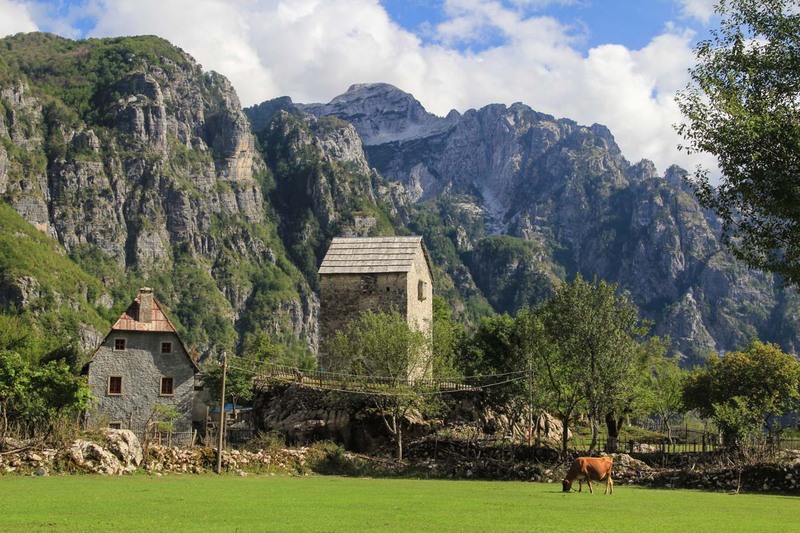 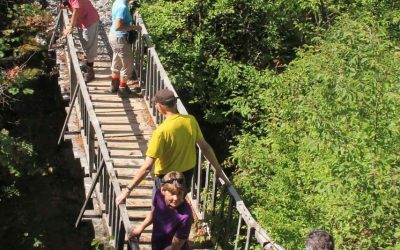 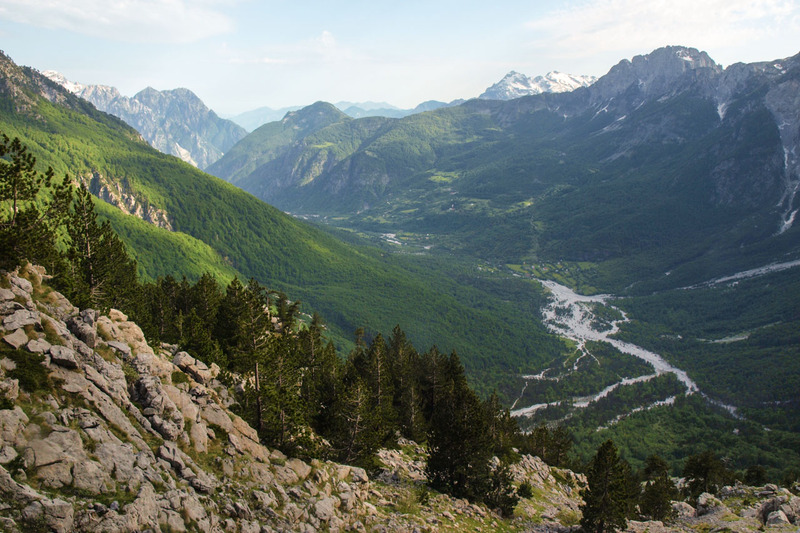 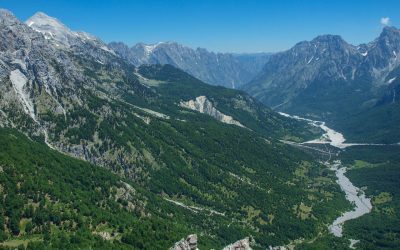 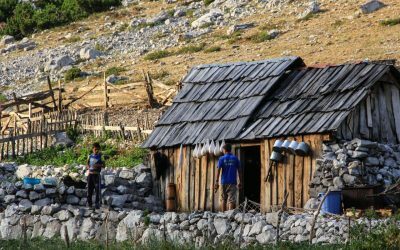 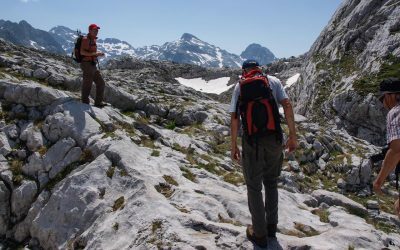 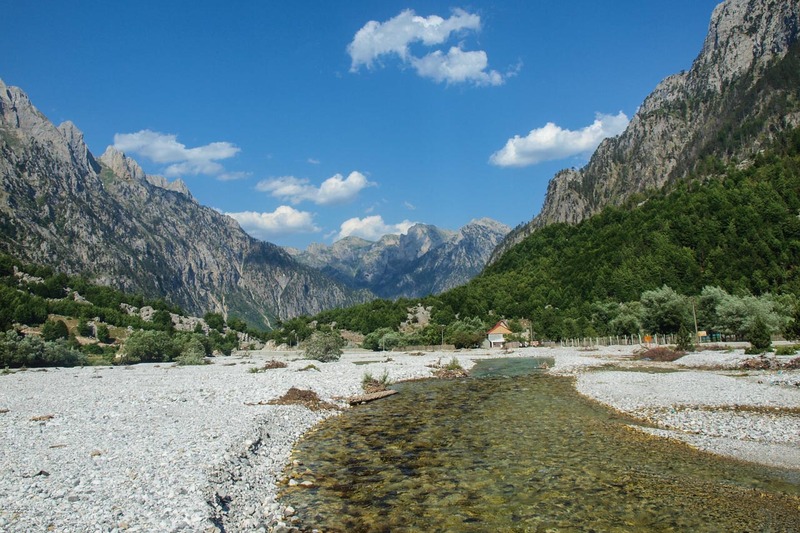 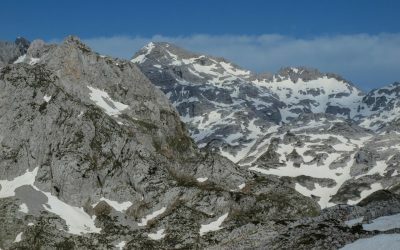 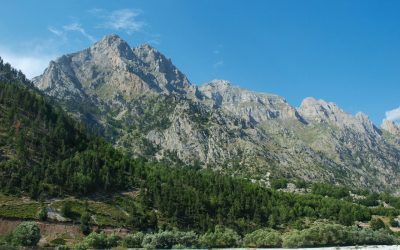 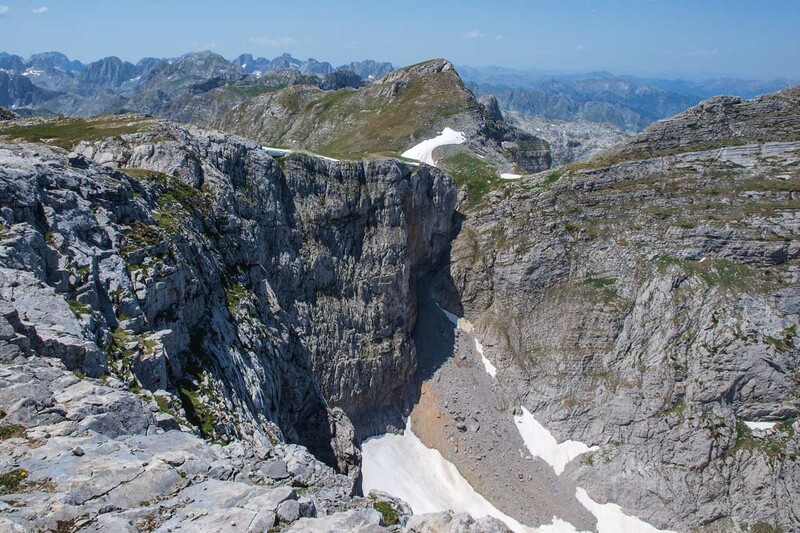 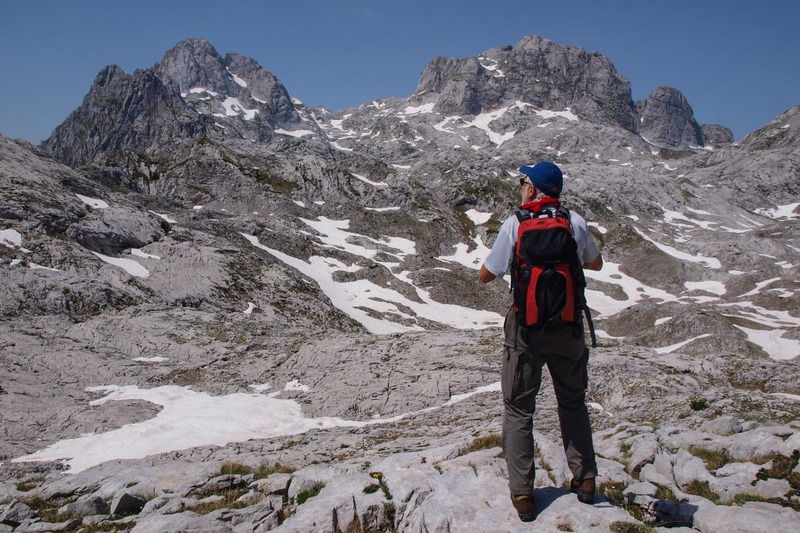 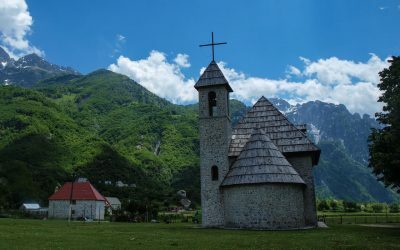 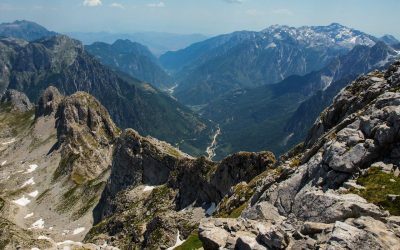 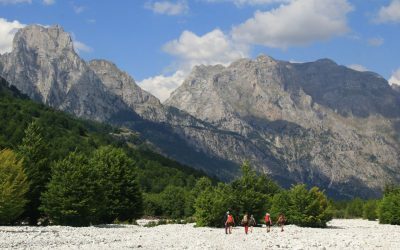 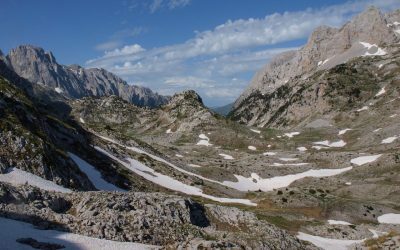 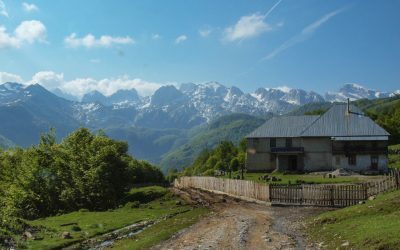 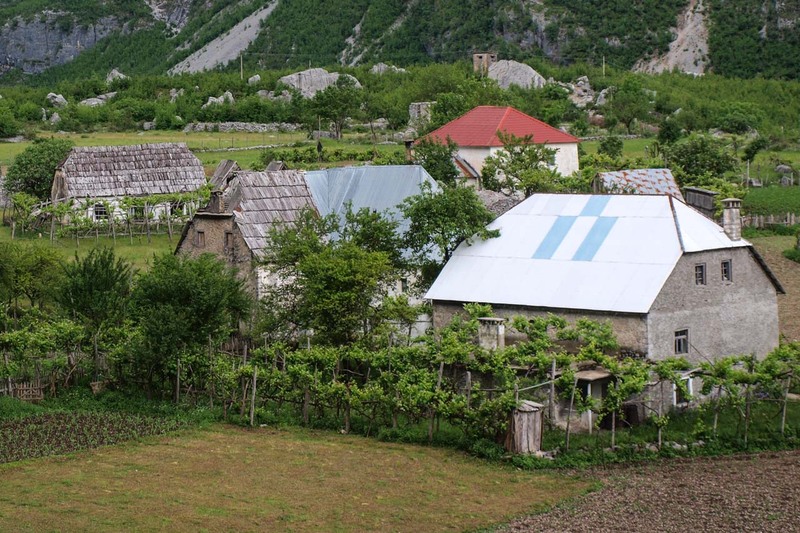 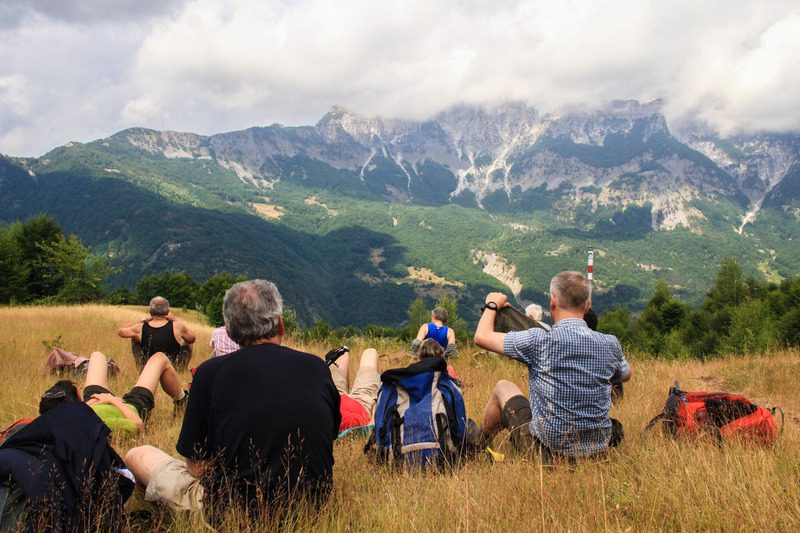 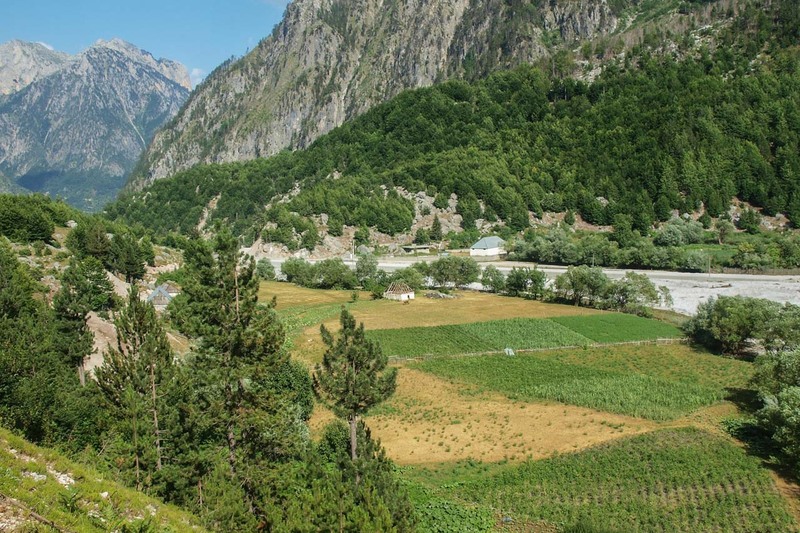 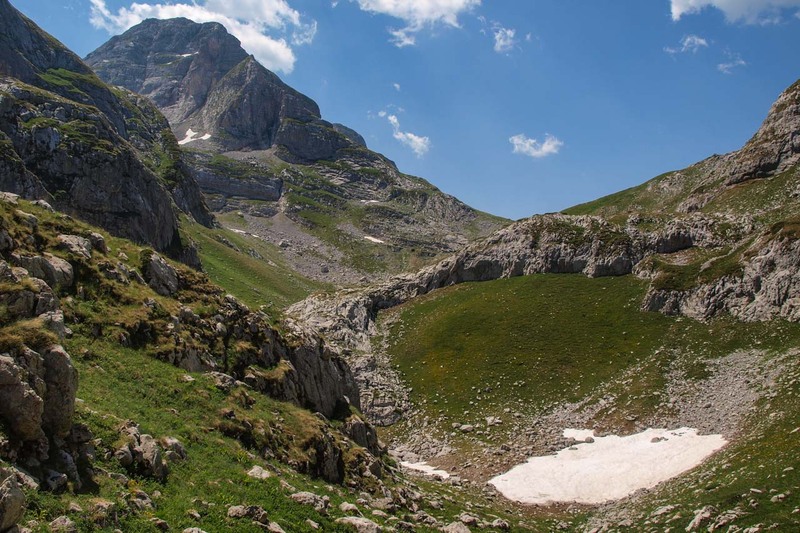 This tour is perfect for experienced hikers who are eager to explore the full scale of the Albanian Alps’ heart by crossing it on foot from West to East. 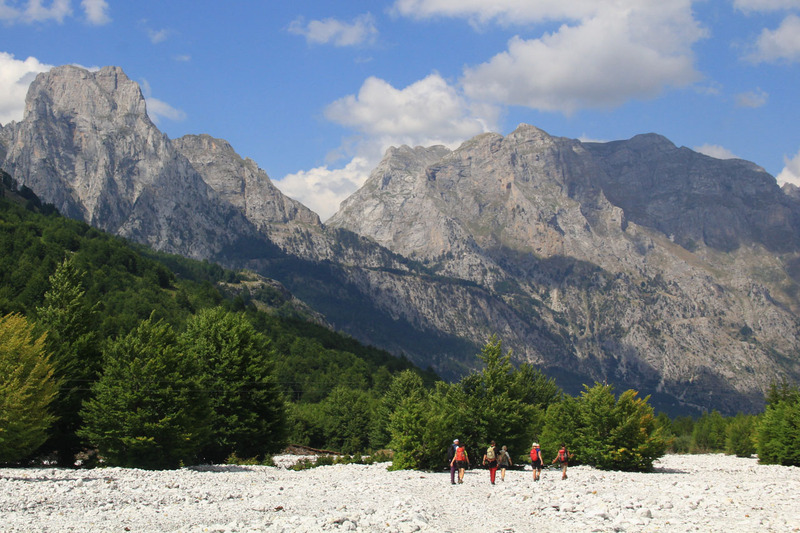 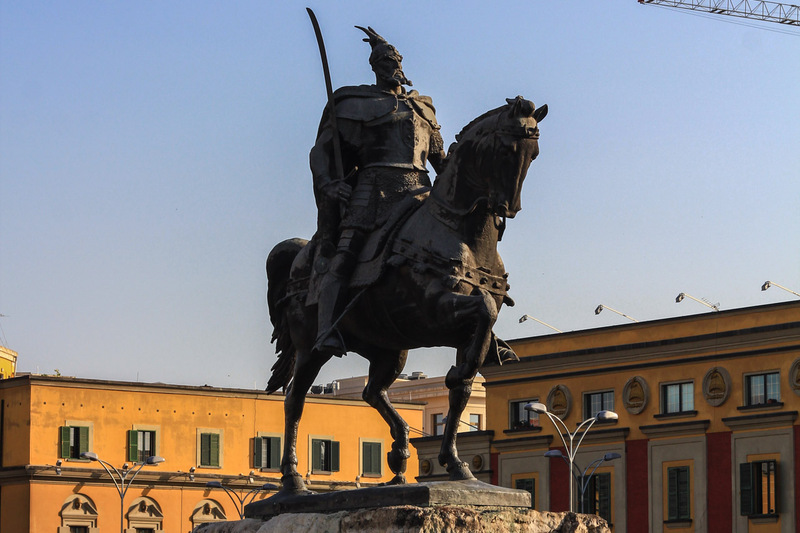 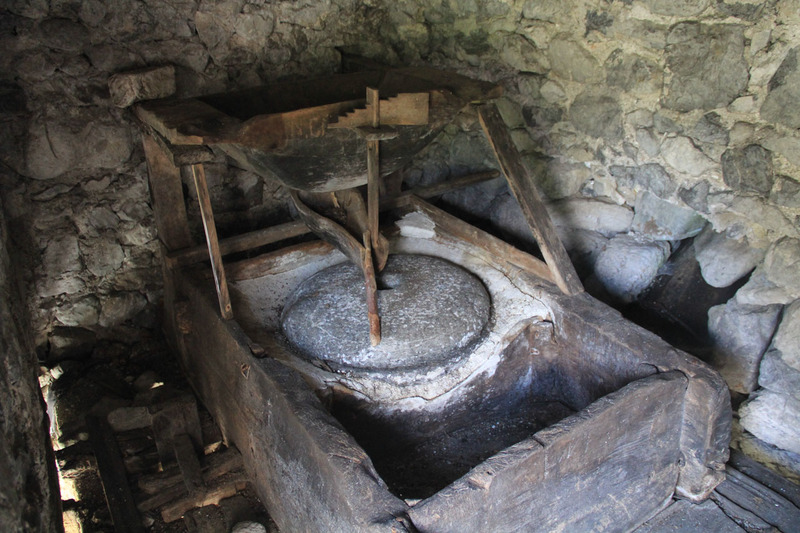 If you like going off the beaten track and are up for a challenge, this tour is for you. 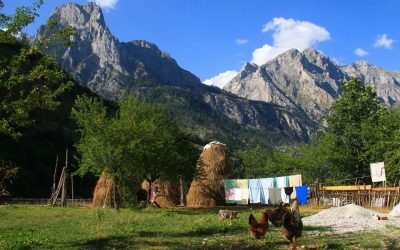 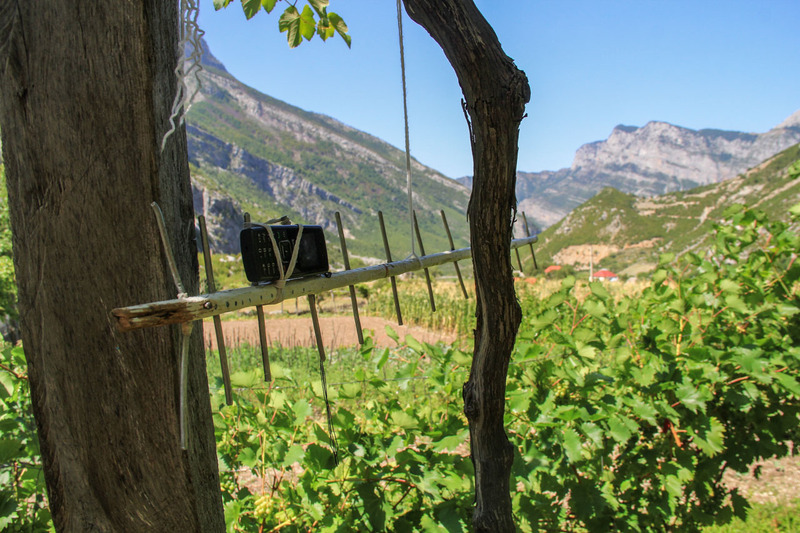 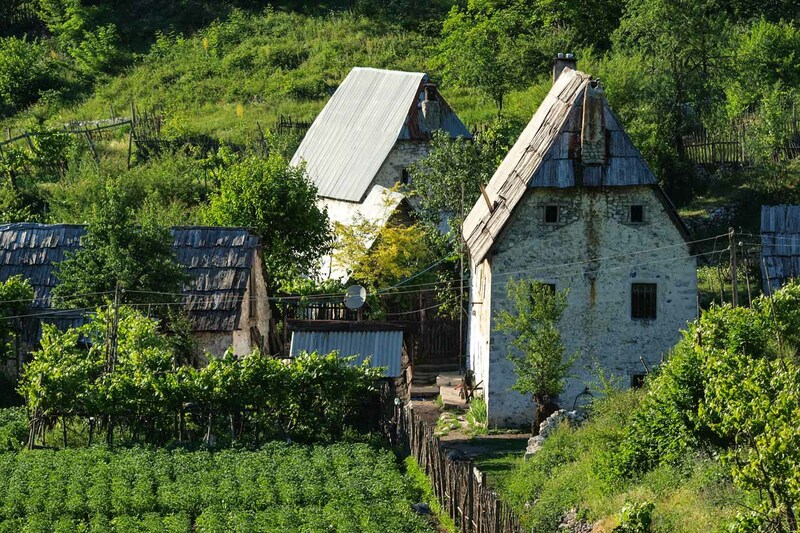 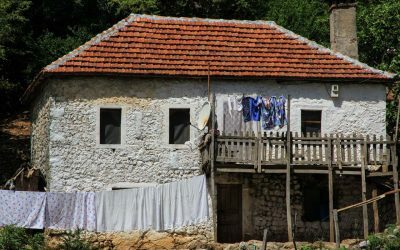 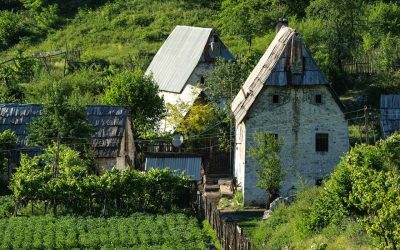 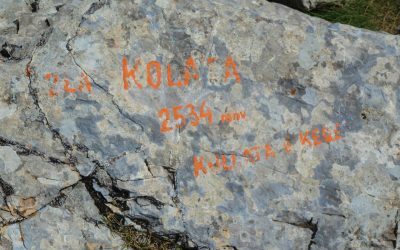 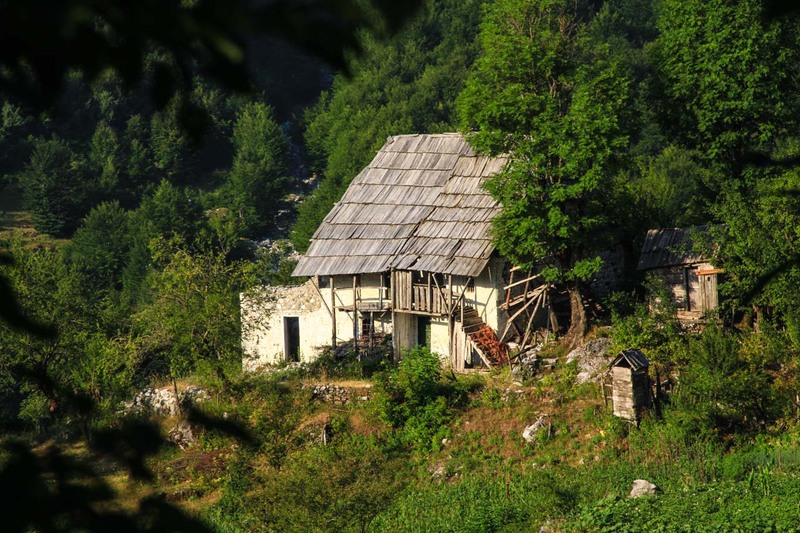 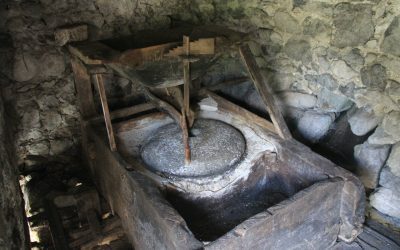 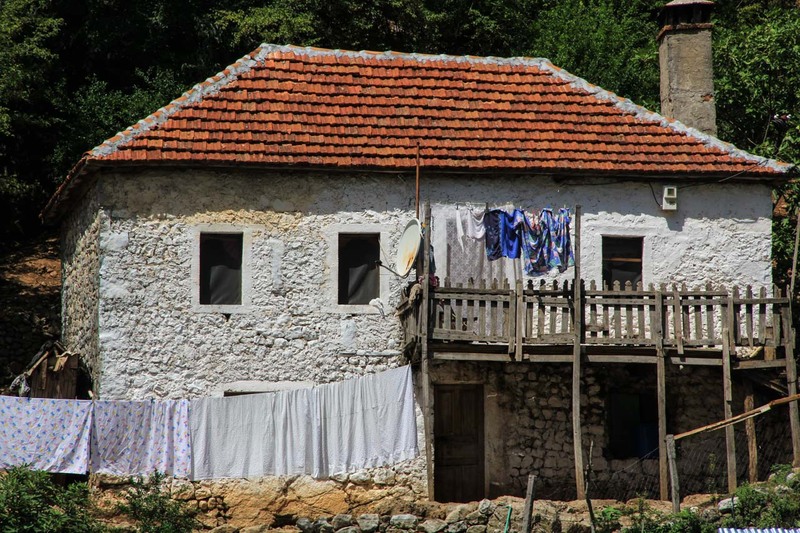 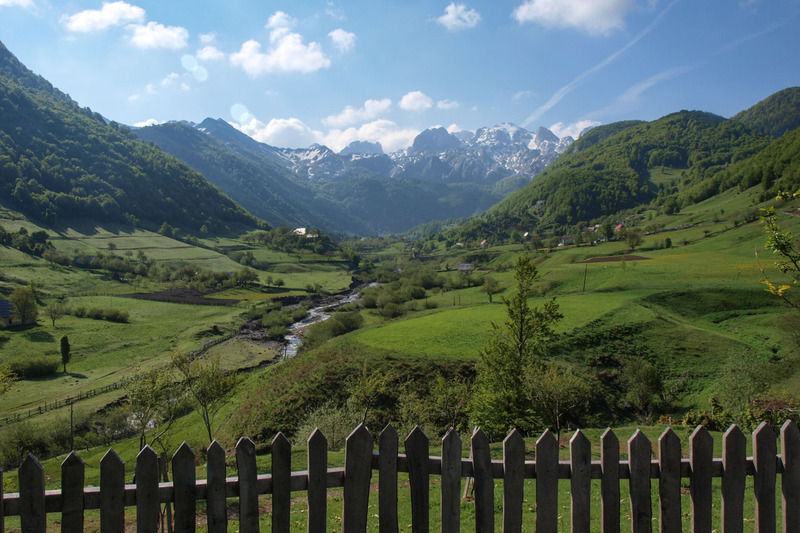 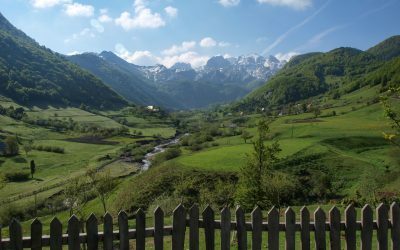 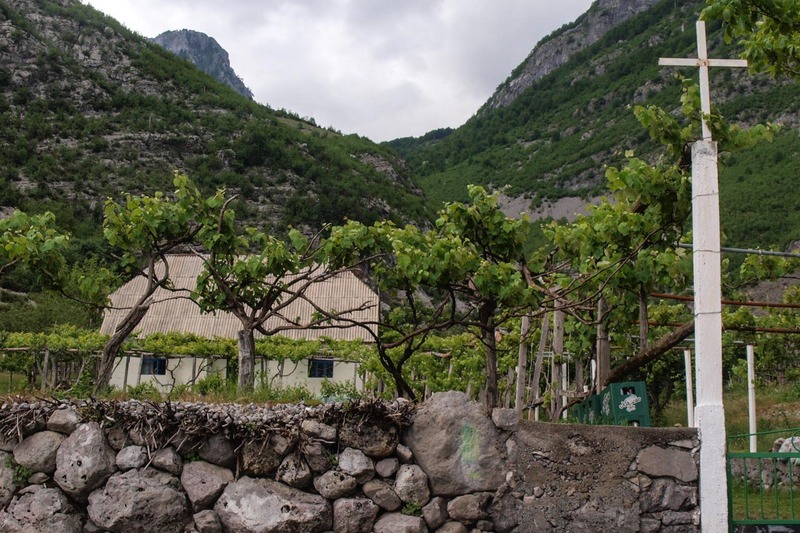 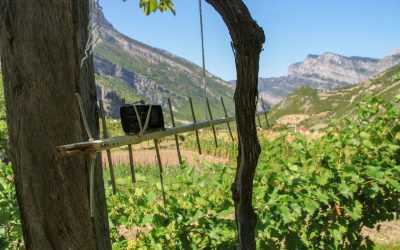 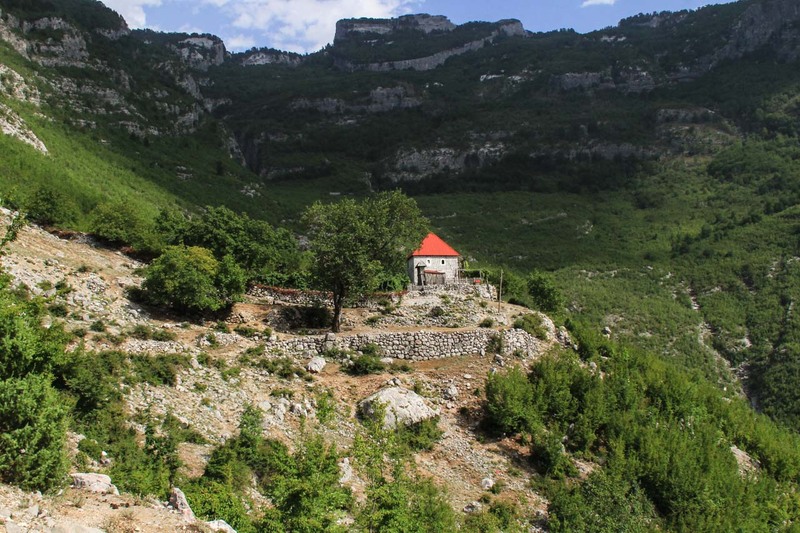 The itinerary covers the three most remarkable regions in the Dinaric Alps: Kelmend, Thethi and Valbona, all dominated by towering mountains but different in lifestyle, mindset of people and architecture. 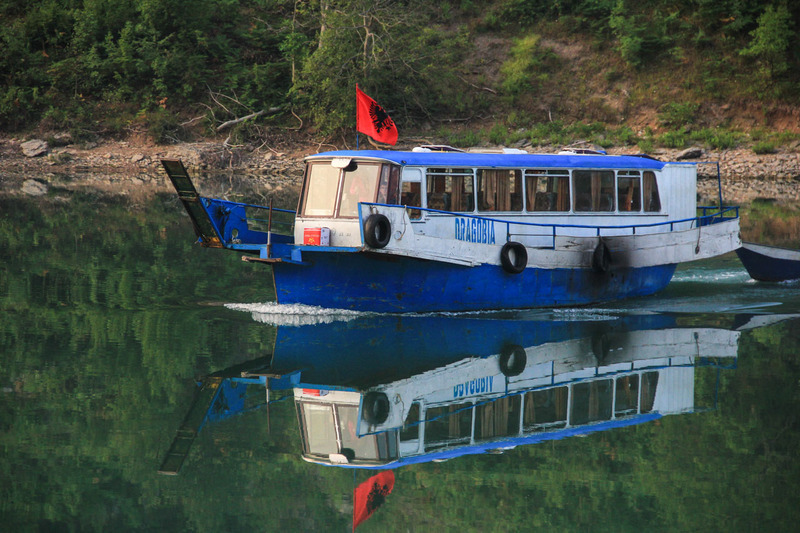 Bound for the capital Tirana a scenic ferry ride across the Koman Lake awaits. 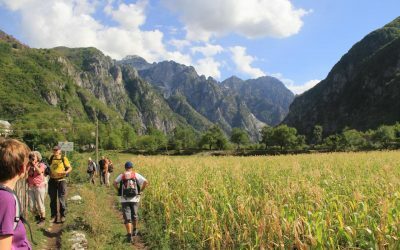 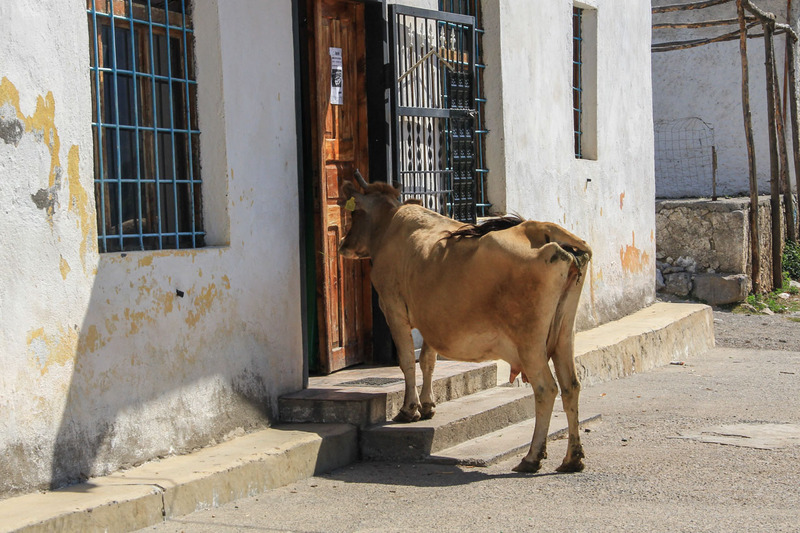 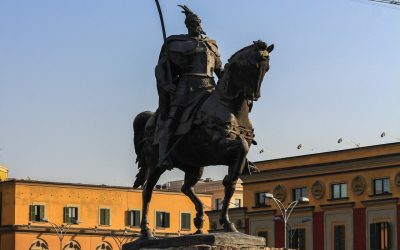 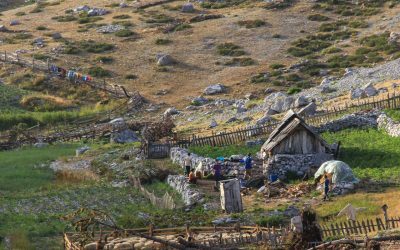 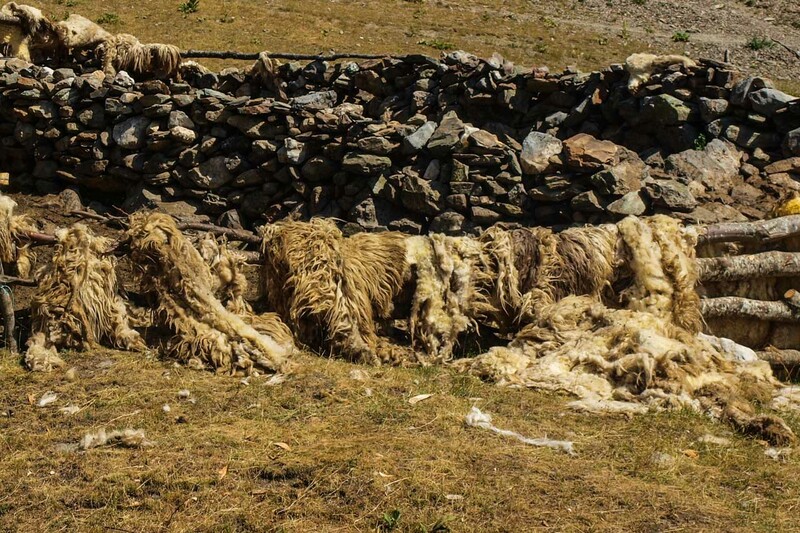 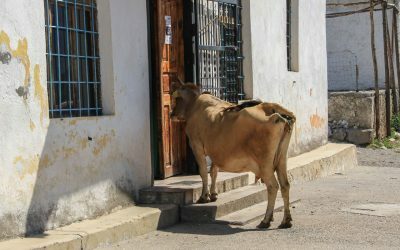 A special tour for very fit and ambitious hikers who aim high and look for a trekking adventure that offers close contact with the highlanders and insights into the peculiarities of their lives. 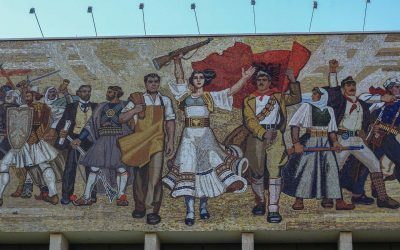 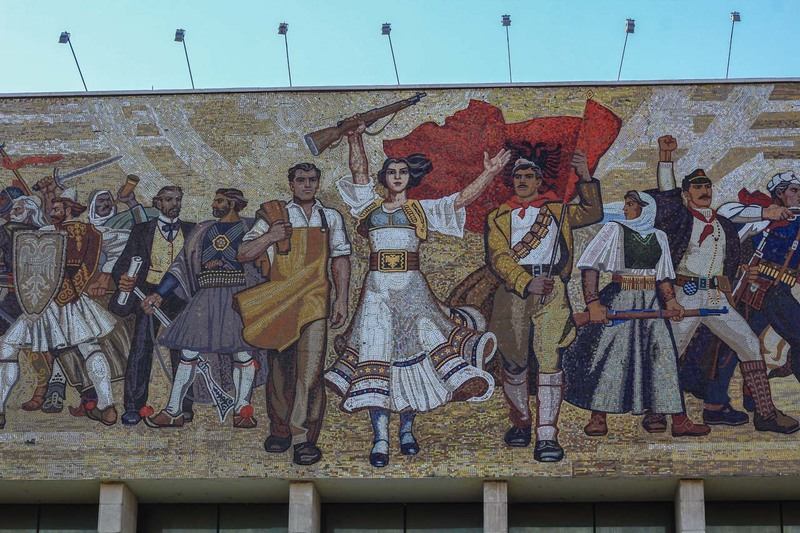 After the rendezvous at the airport in Podgorica the group continues straight away to Albania. 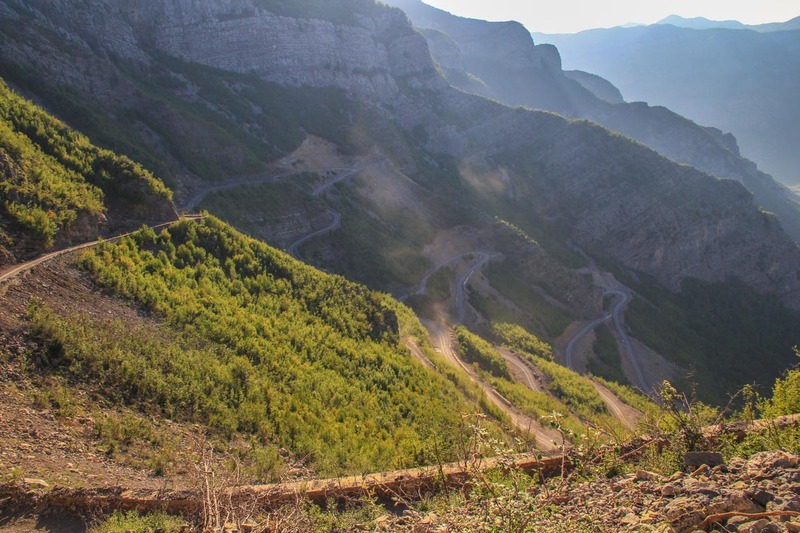 Leaving the border behind, the dirt road enters the highlands through the Cemi Canyon. 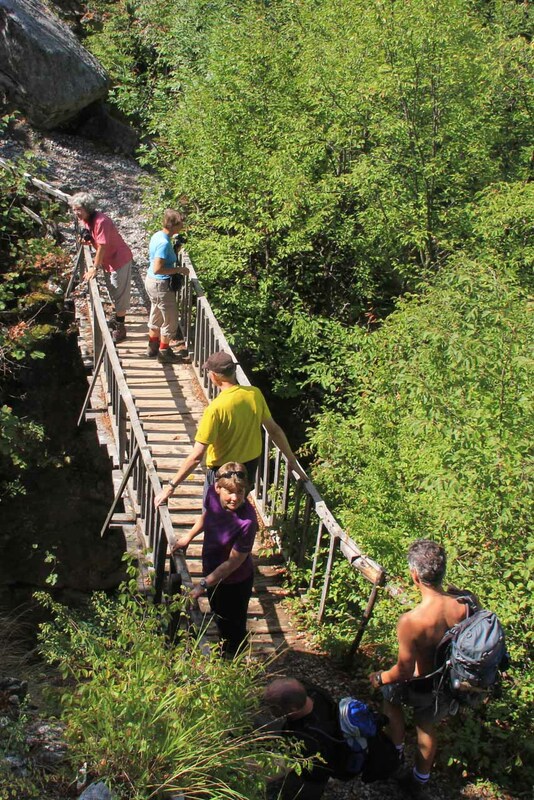 From its rim the Stairs of Kelmend zigzag down into the canyon offering tremendous views. 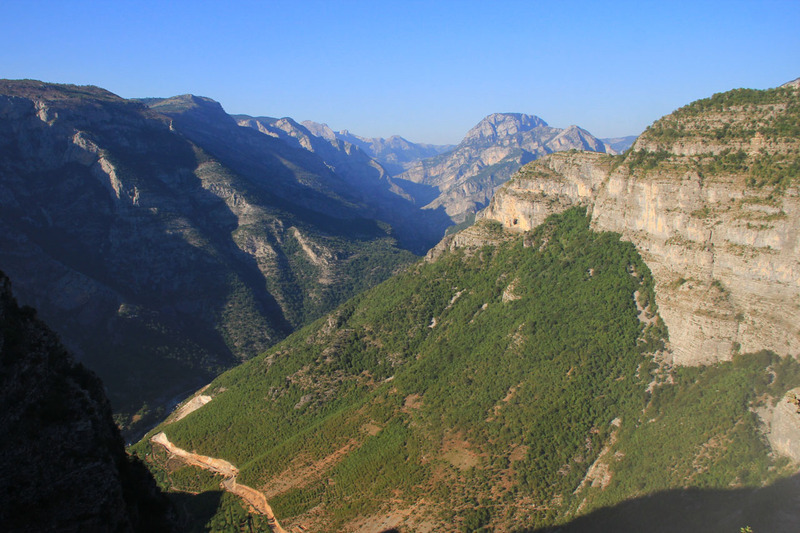 After passing the villages Tamara and Selca we arrive at an altitude of 1319m at Qafa Bordolecit, the night will be spent nearby with views of the central massif. 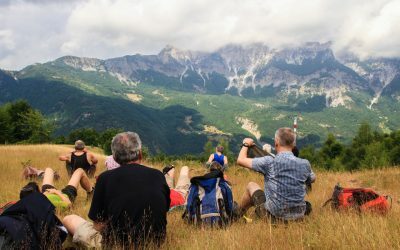 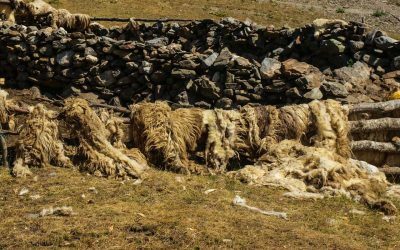 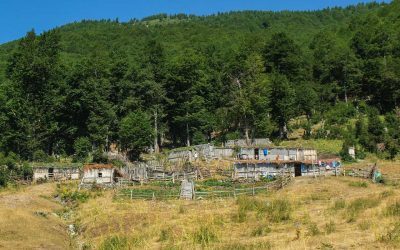 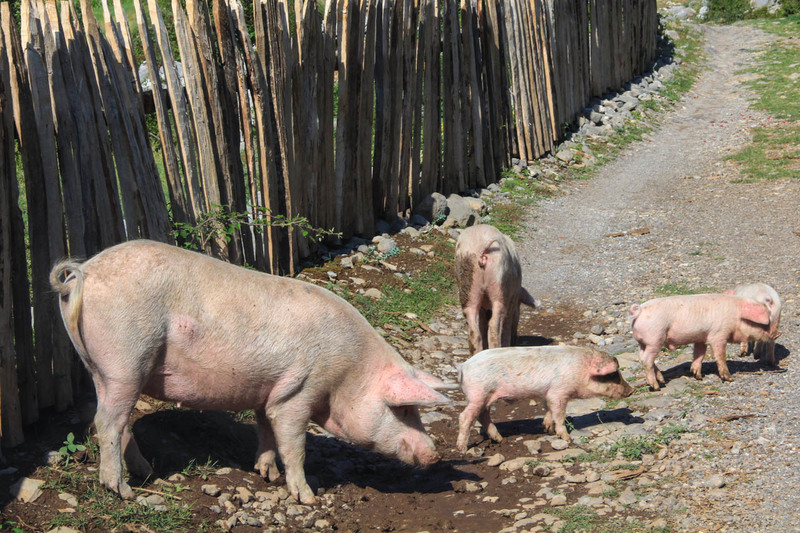 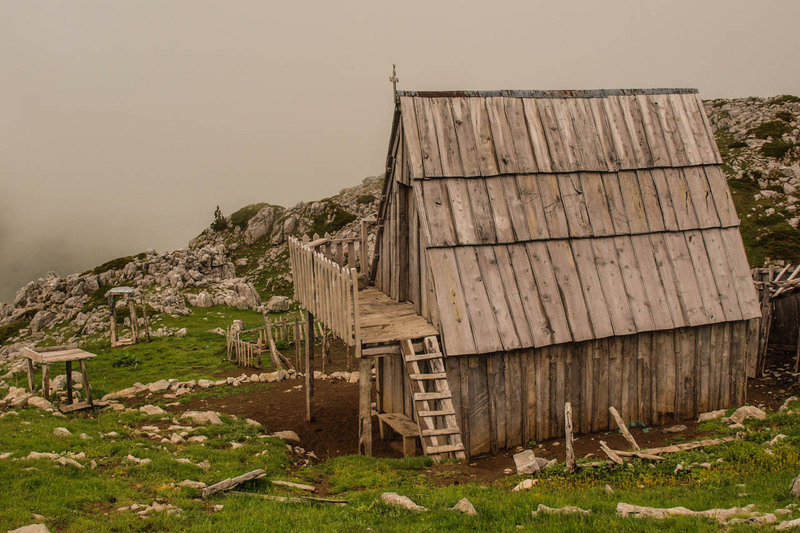 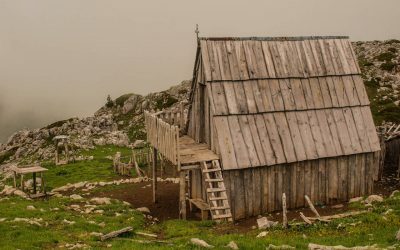 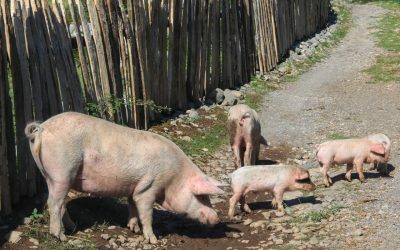 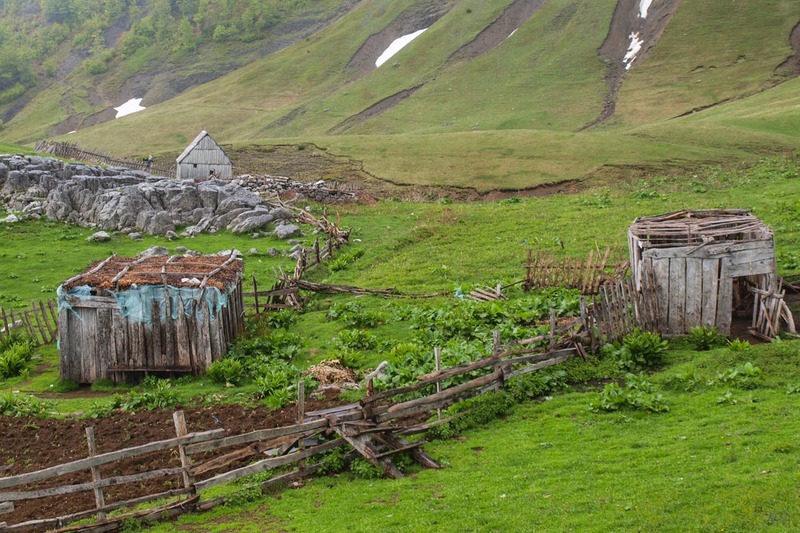 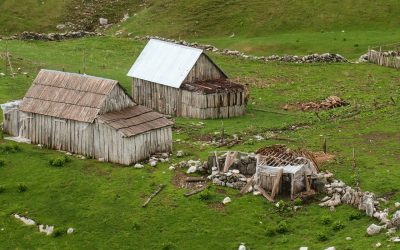 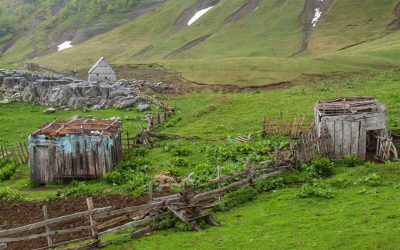 The next day’s walk takes the group closer to the heart of the Alps, walking from Lepushe via the wonderful Koprishti summer pastures or Mt Berizdholit to the next destination, while the grey and hostile looking karst rocks appear almost within ones reach. 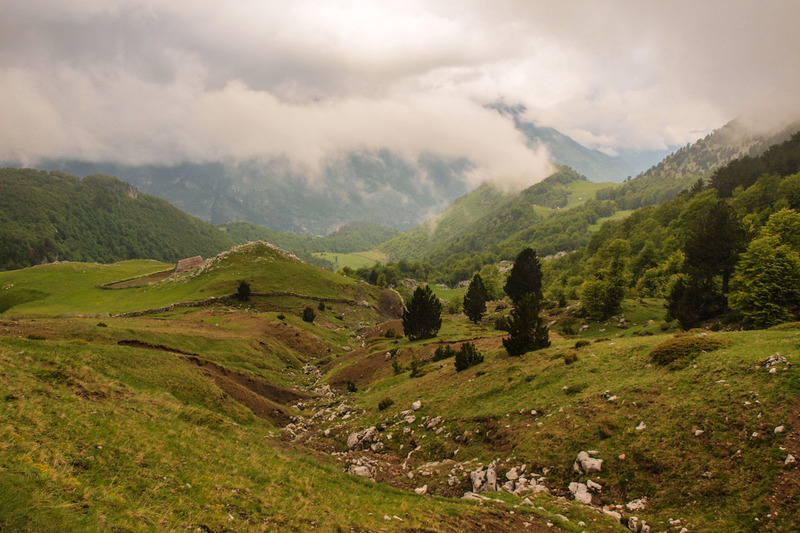 Behind the pastures the trail descends with unbelievably scenic views of the natural amphitheater of Lugina e Nikcit, where both Vukel (reached first) and our destination Nikc are located. 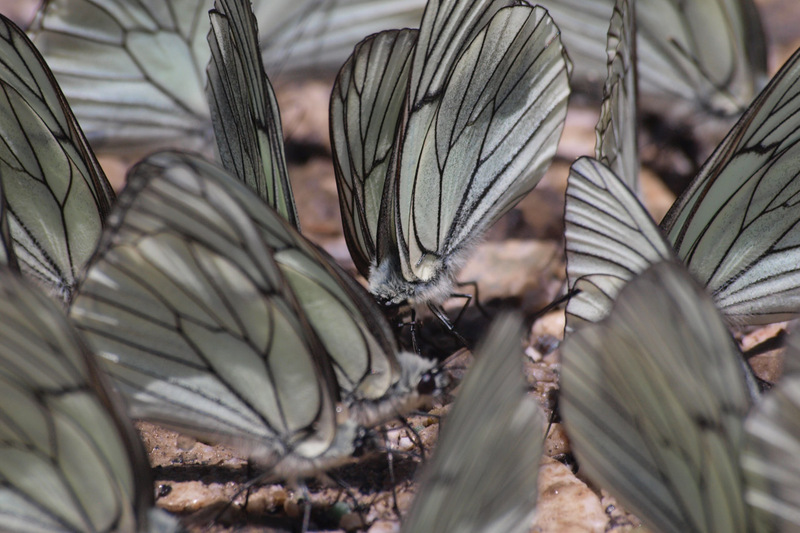 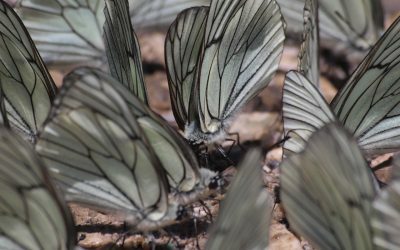 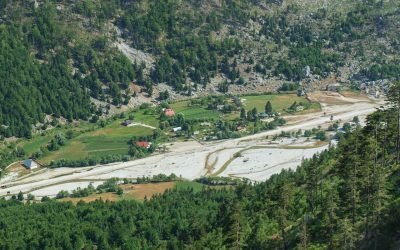 The long transfer hike from Kelmend to Theth often leaves the strongest impression. 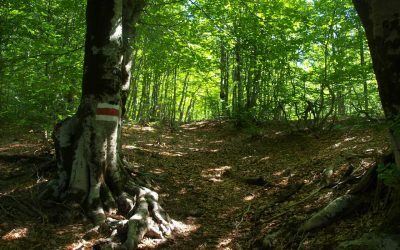 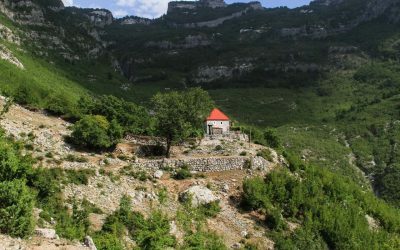 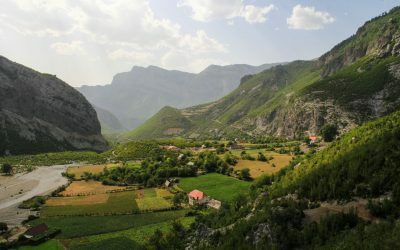 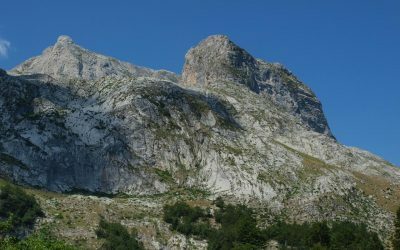 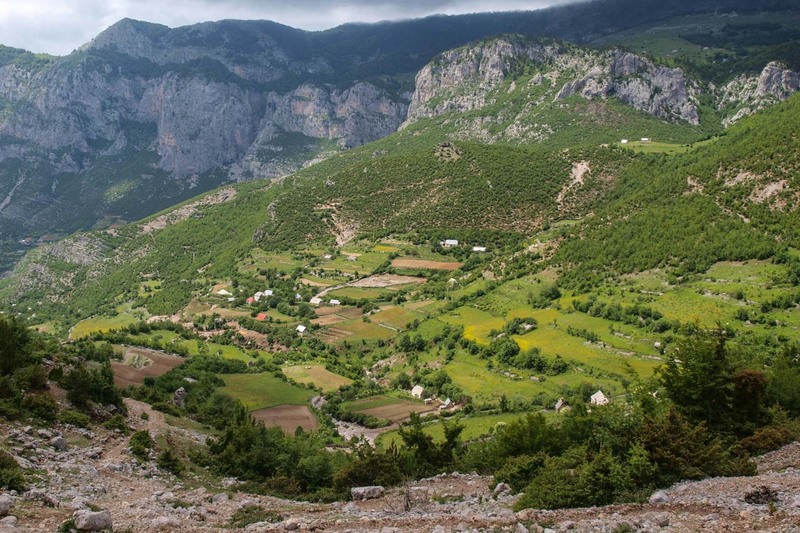 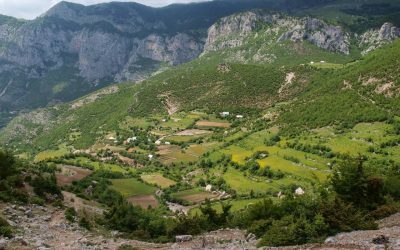 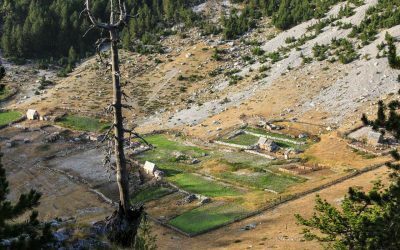 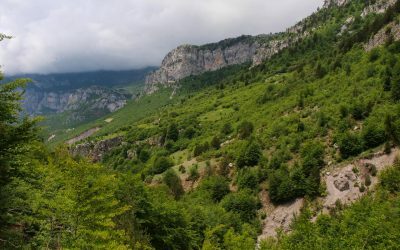 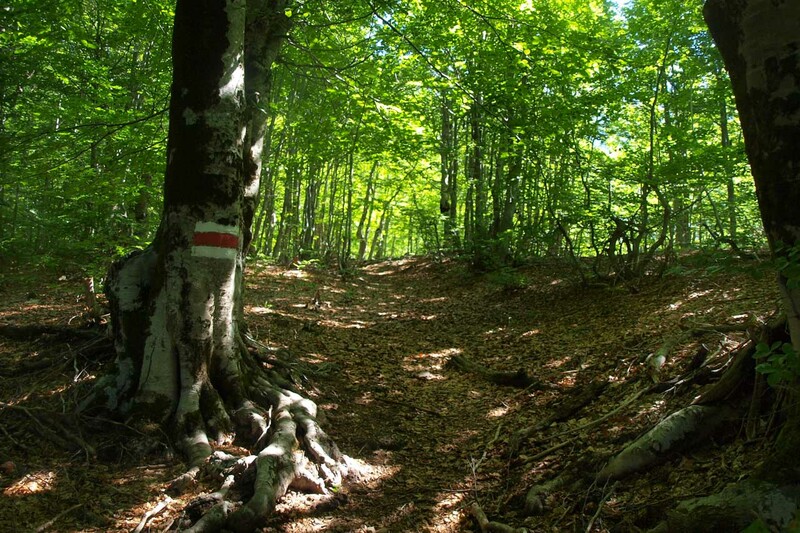 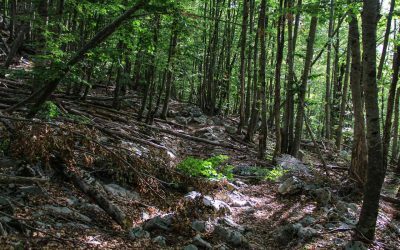 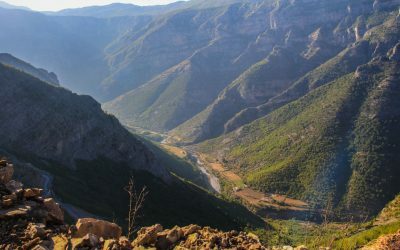 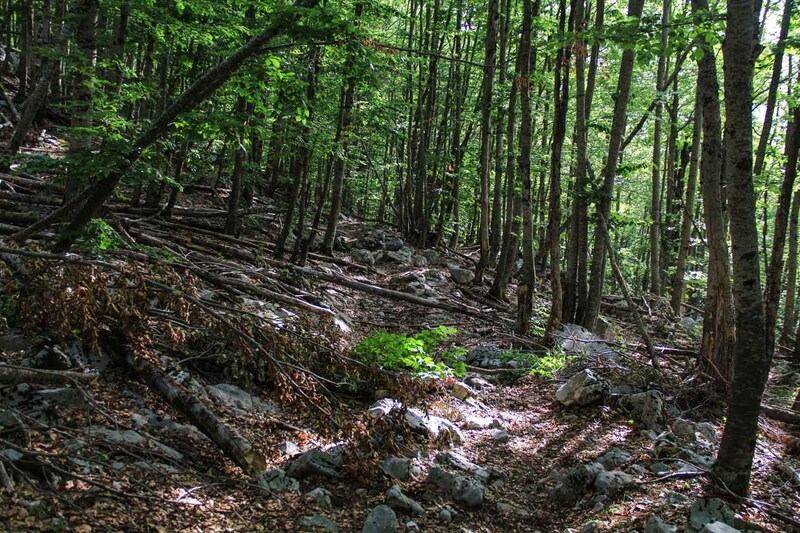 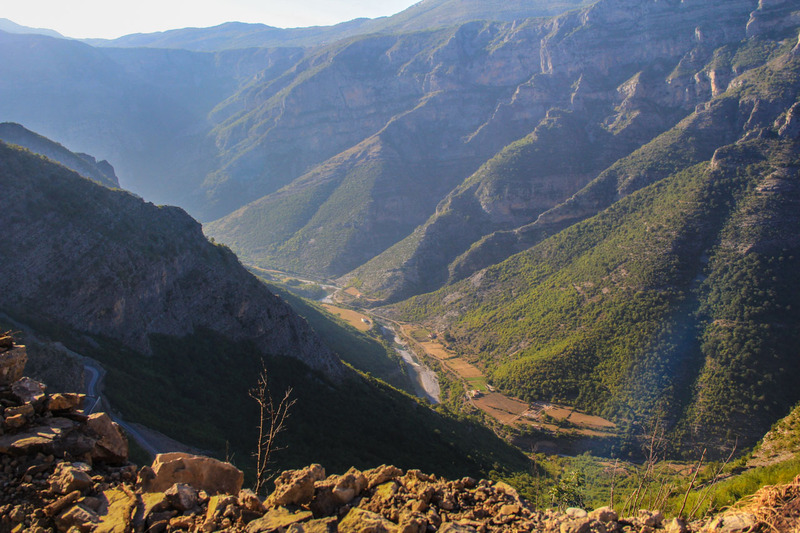 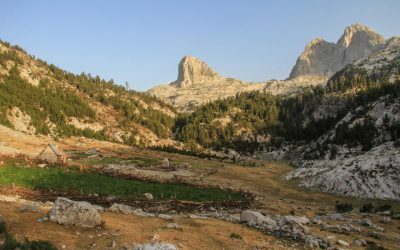 Very few hikers tackle the route that leads past the Kelmendi Fortress (a natural castle) to the green oasis at Dobraces. 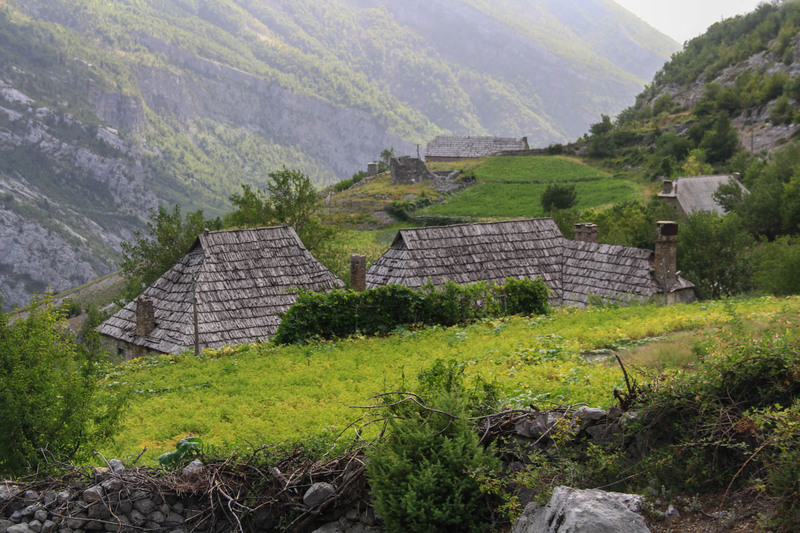 The shepherds’ village makes for a good picnic stop. 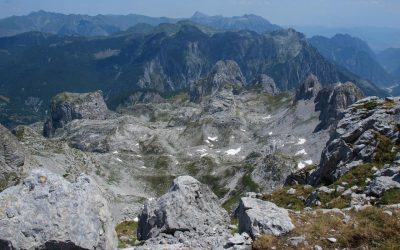 Onwards the jags of Mt Shtogu and Mt Arapi rise from the extremely rugged karst plateau that has to be traversed to eventually descend via the Peja Pass to Theth. 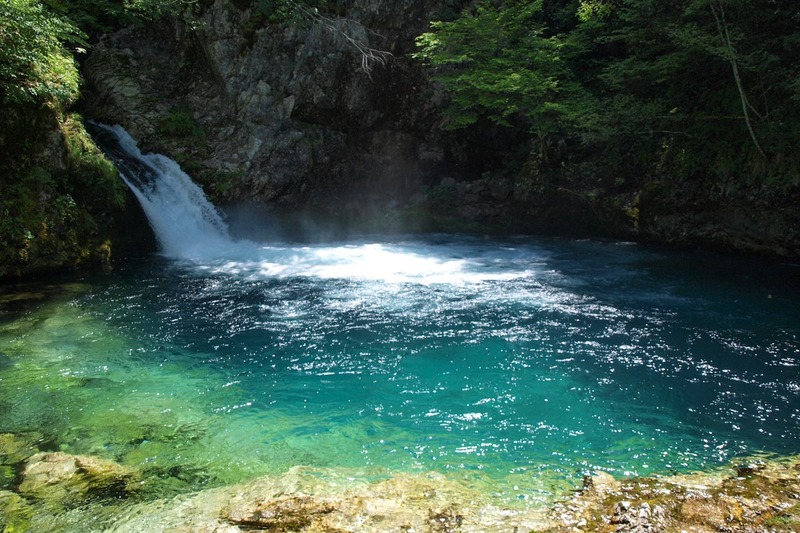 The fourth day is at free disposal. 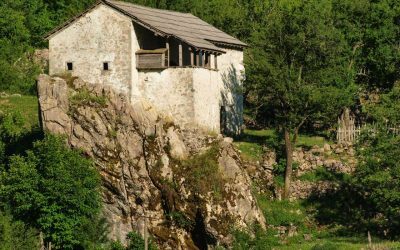 The guesthouse is an inviting place to relax, as are many spots by the river that offer swimming nearby. 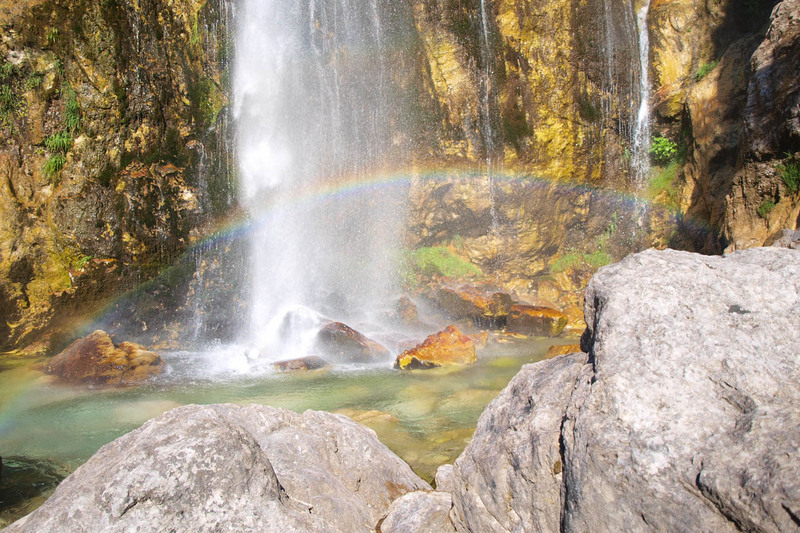 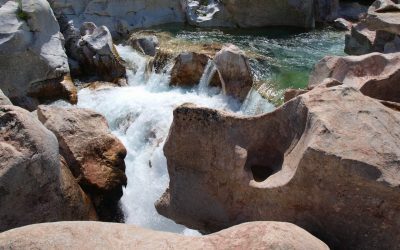 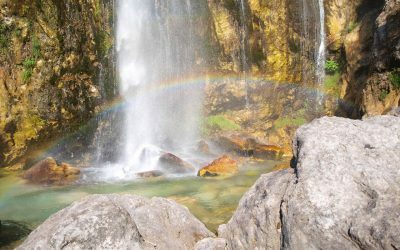 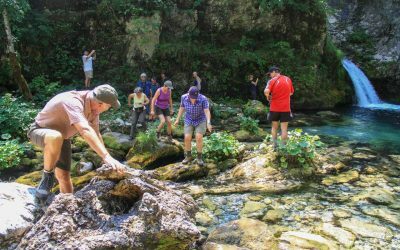 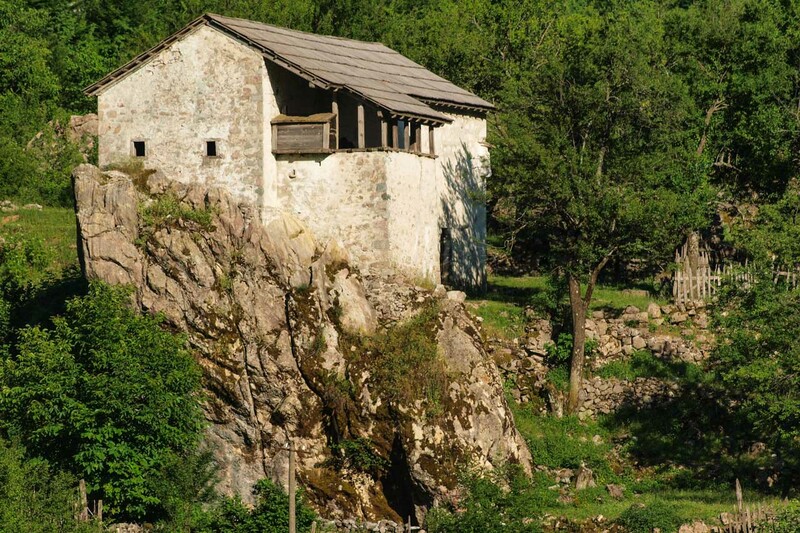 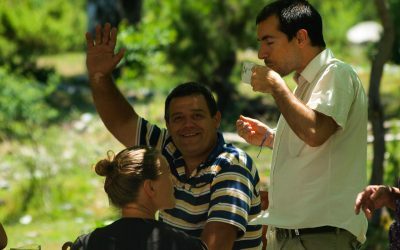 The village can be explored individually and an optional guided walk will be offered, that visits the Kulla (lock-in tower), Grunas Waterfall and Canyon, as well as village Nderlysa downstream and the adjacent valley of Kapreja with the Blue Eye. 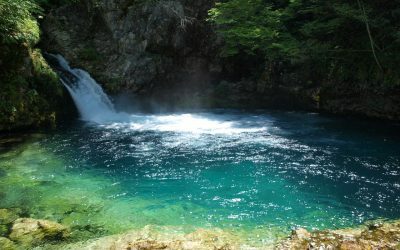 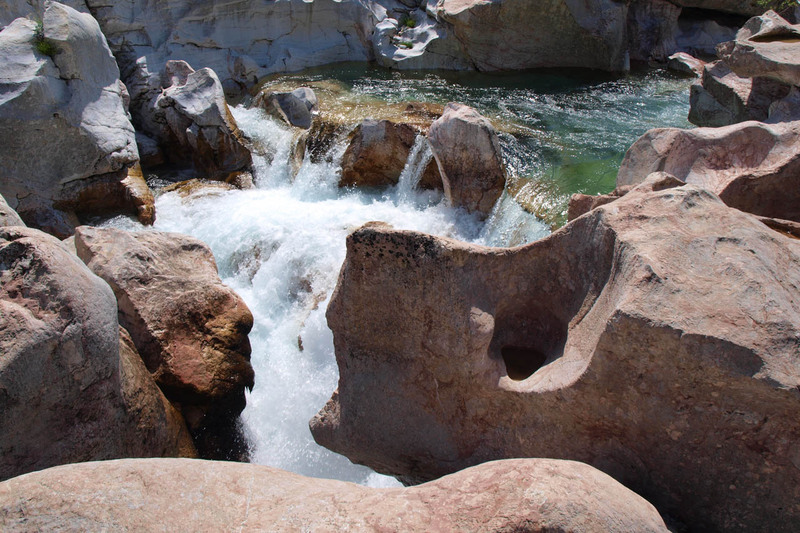 Natural pools and glacial mills invite for swimming. 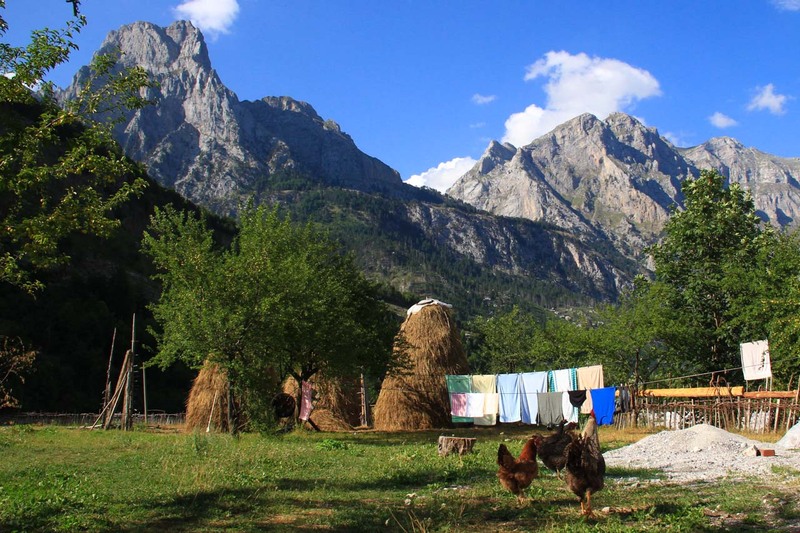 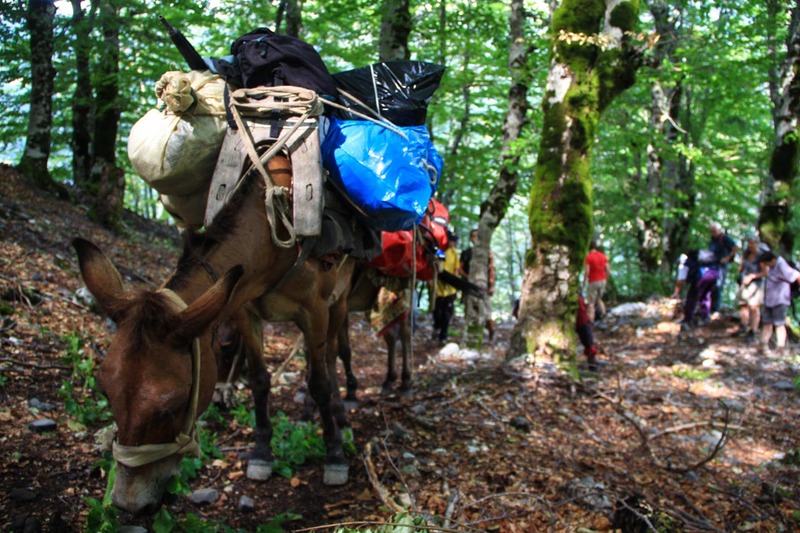 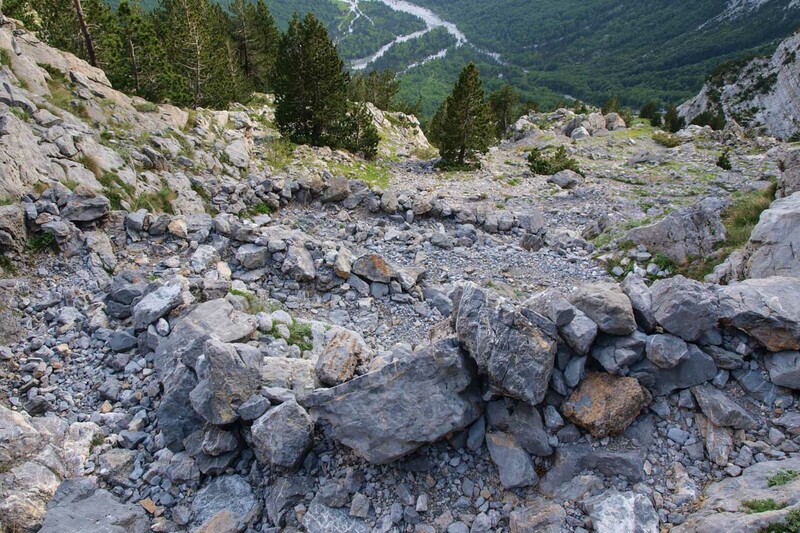 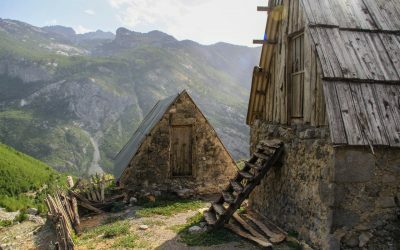 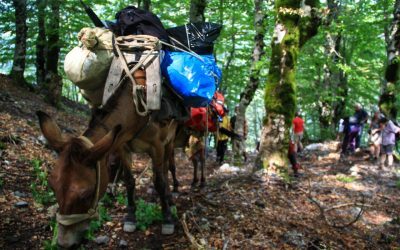 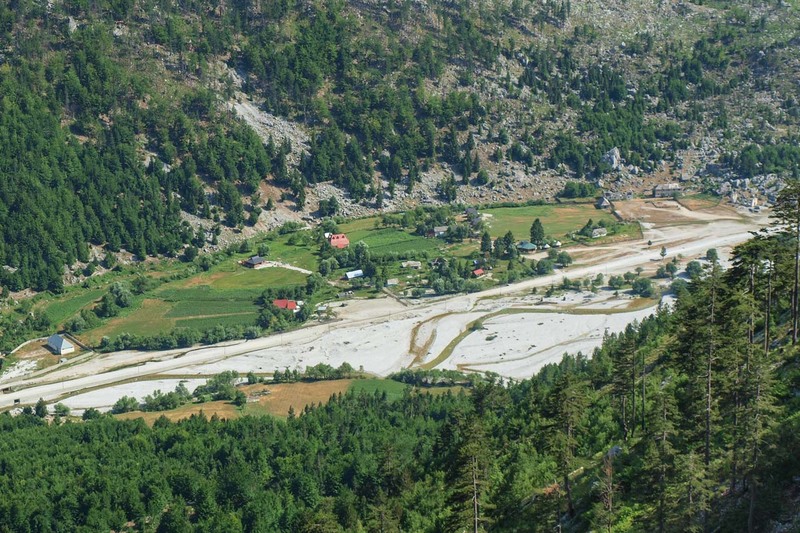 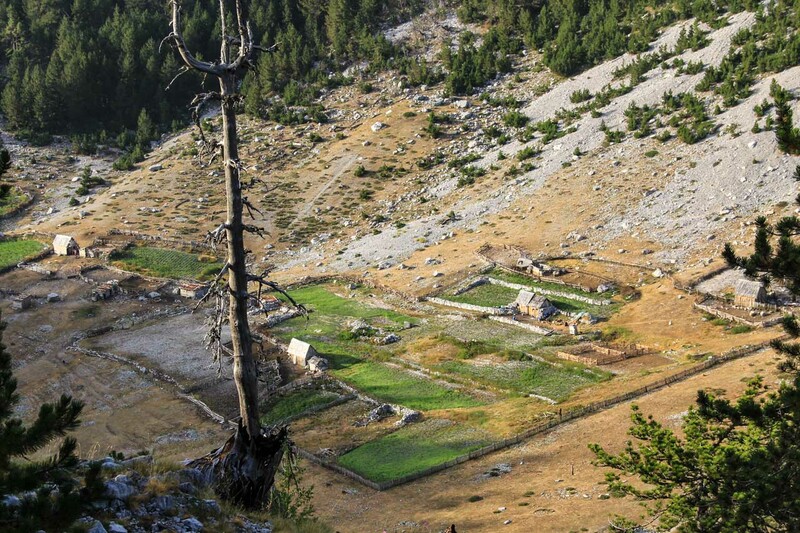 Leaving the traditional stone houses of Theth behind the luggage is transported on horses over the Valbona Pass. 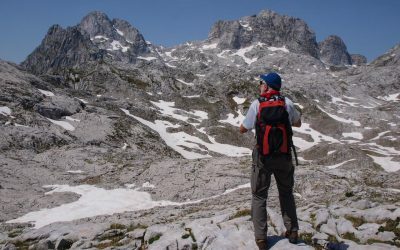 From the narrow pass both valleys stretch out below our rest spot and one feels on par again with the surrounding mountains – an unrivalled viewpoint. In half-abandoned Rragam a stop for cold beverages is possible before the last bit of the walk through the riverbed is taken. 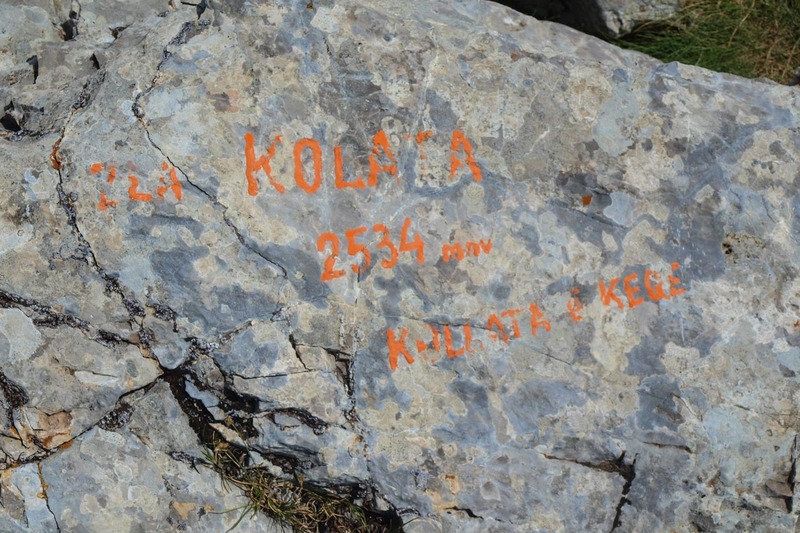 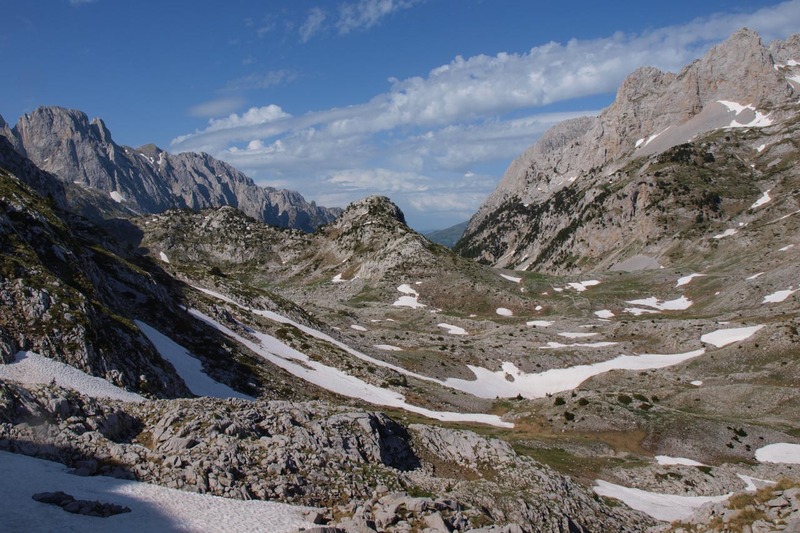 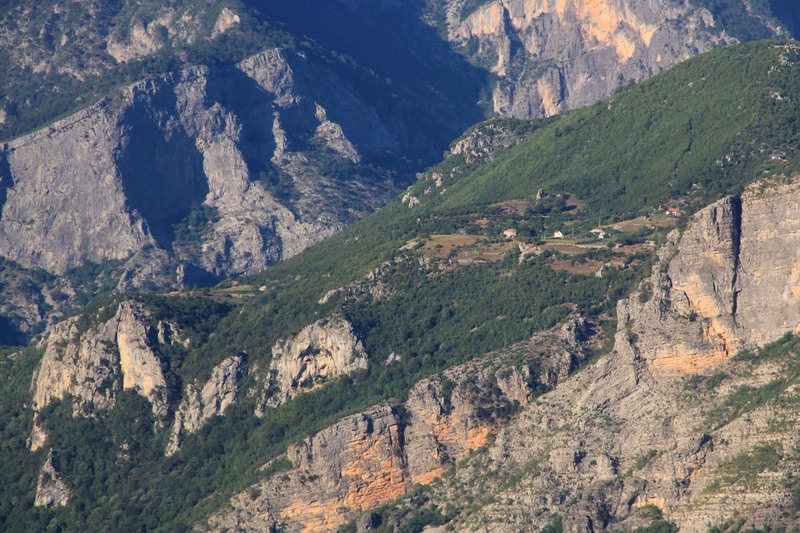 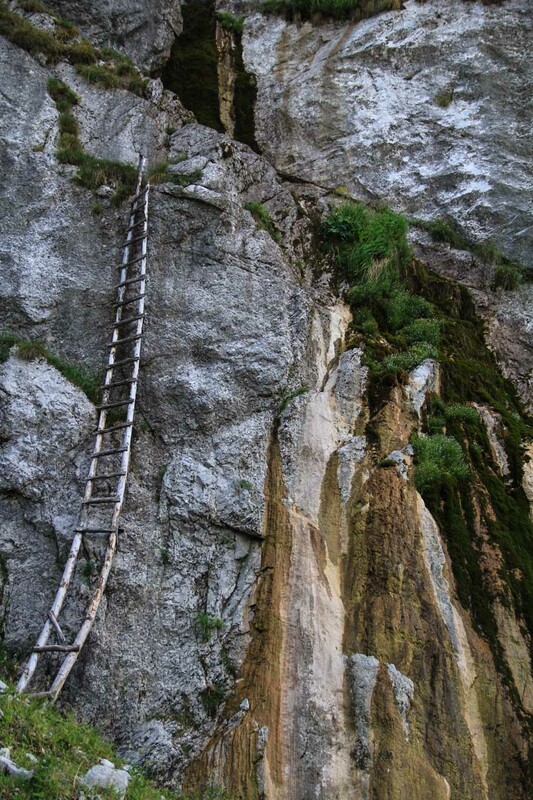 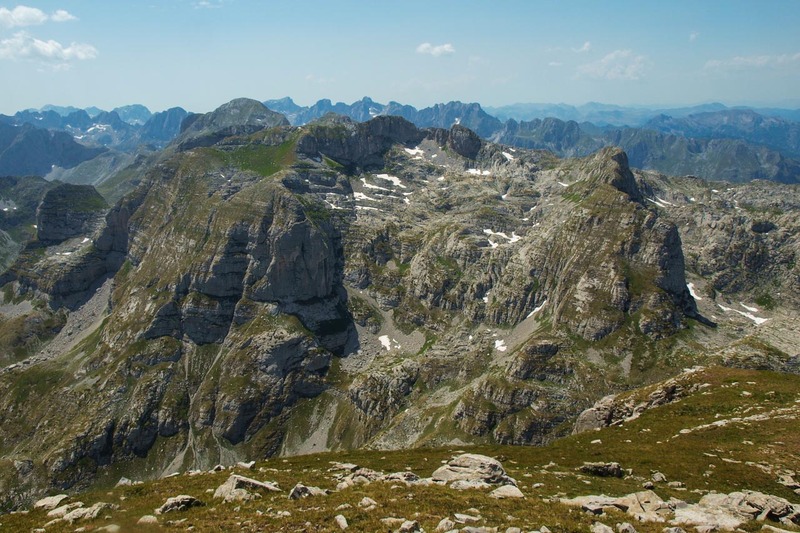 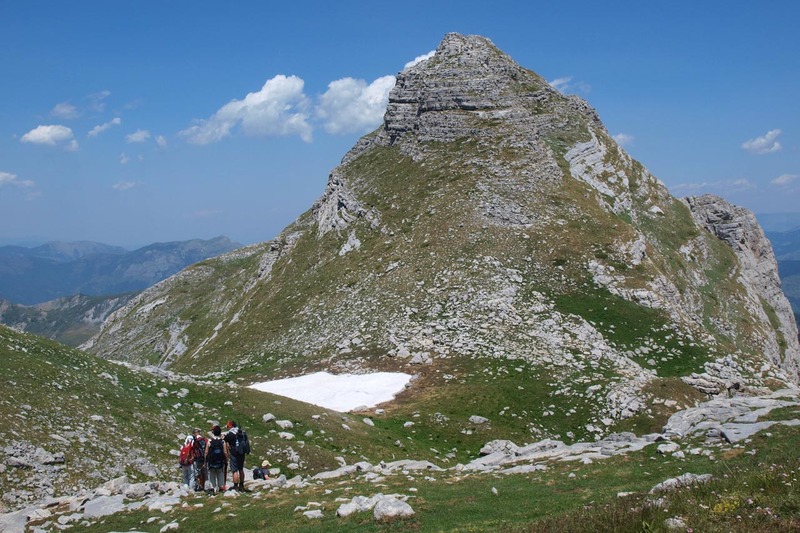 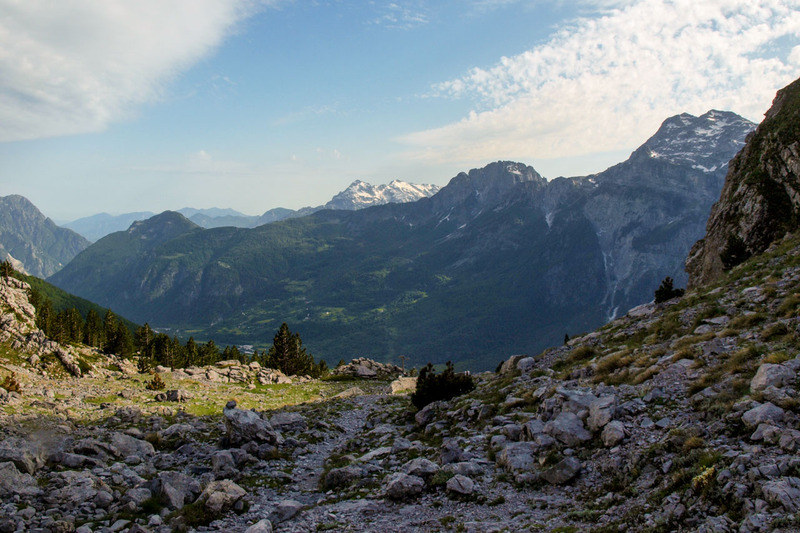 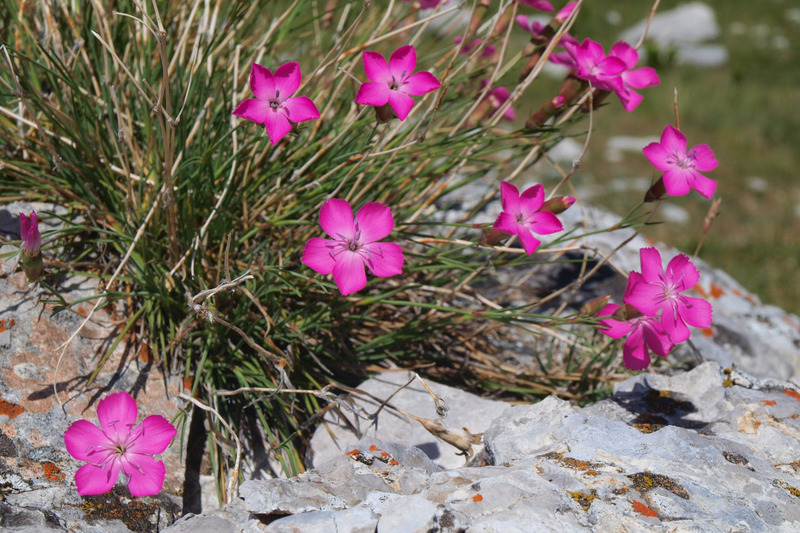 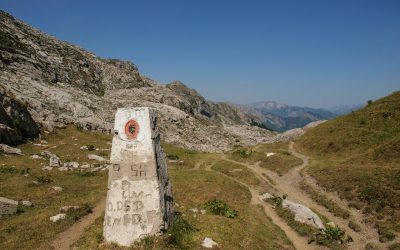 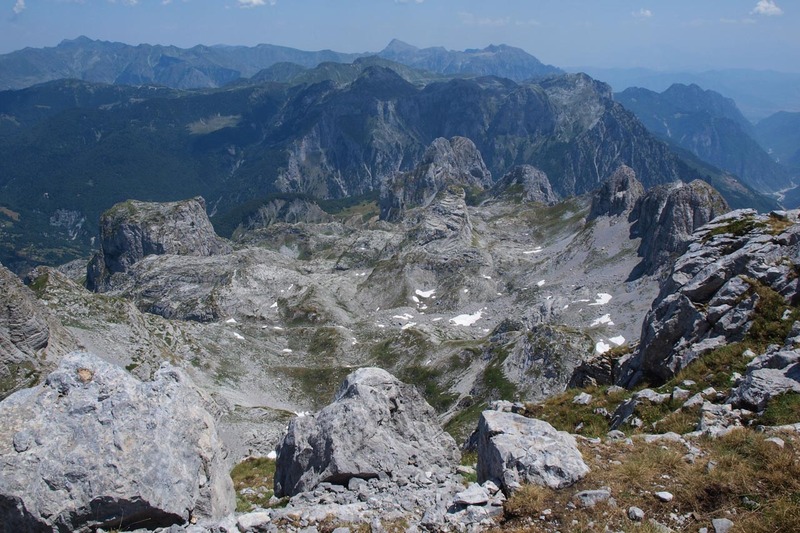 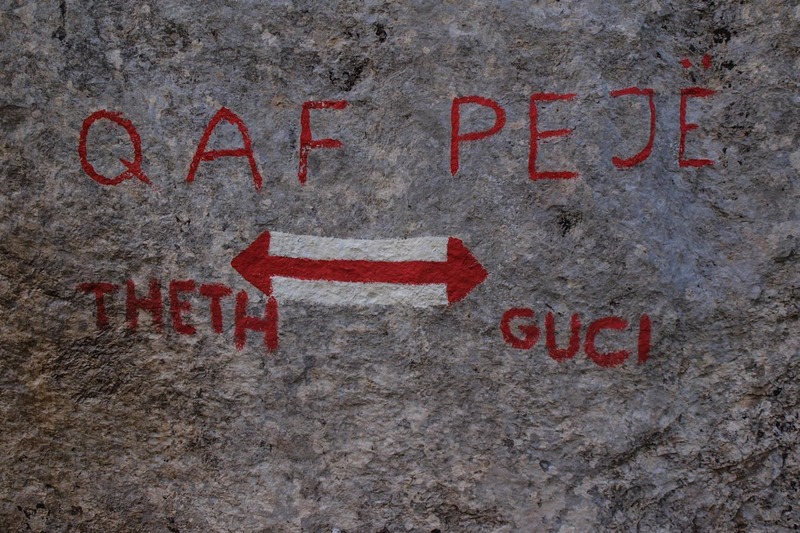 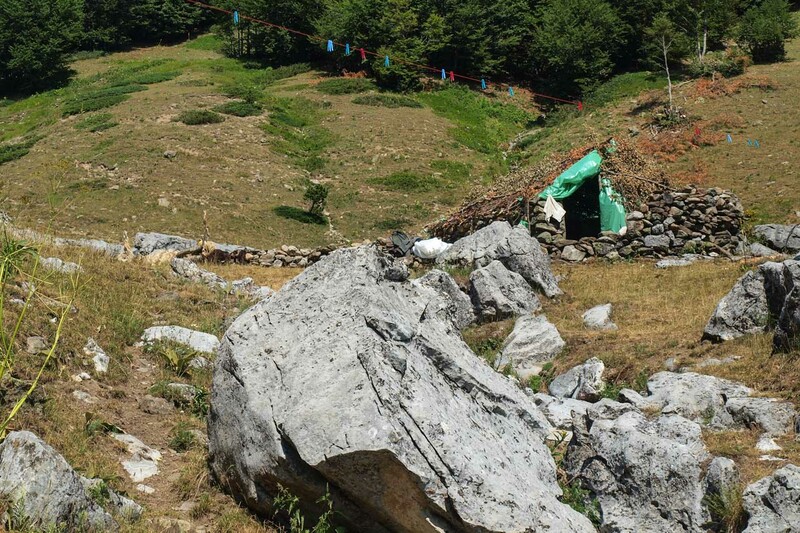 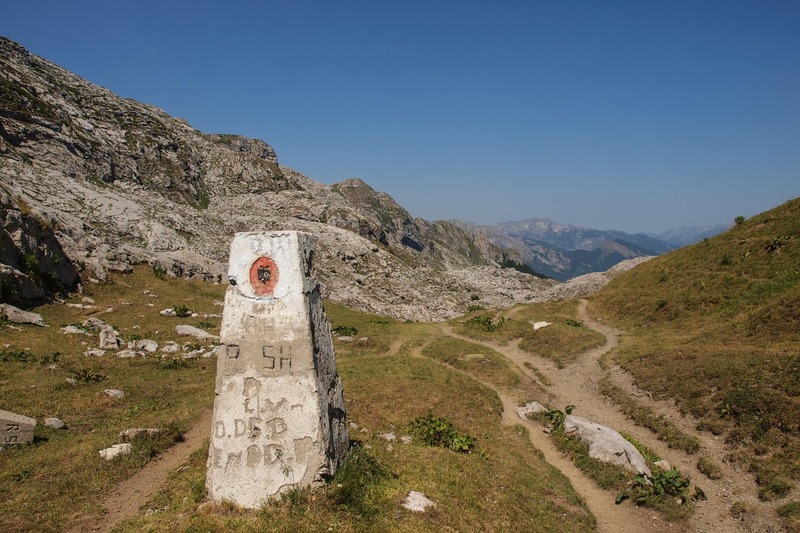 Day 6 offers the possibility to climb the highest mountain of Montenegro, located right at the border with Albania. 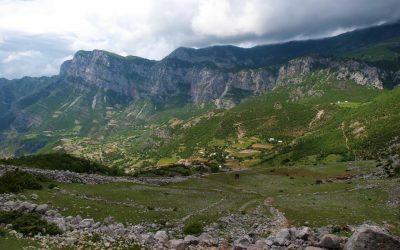 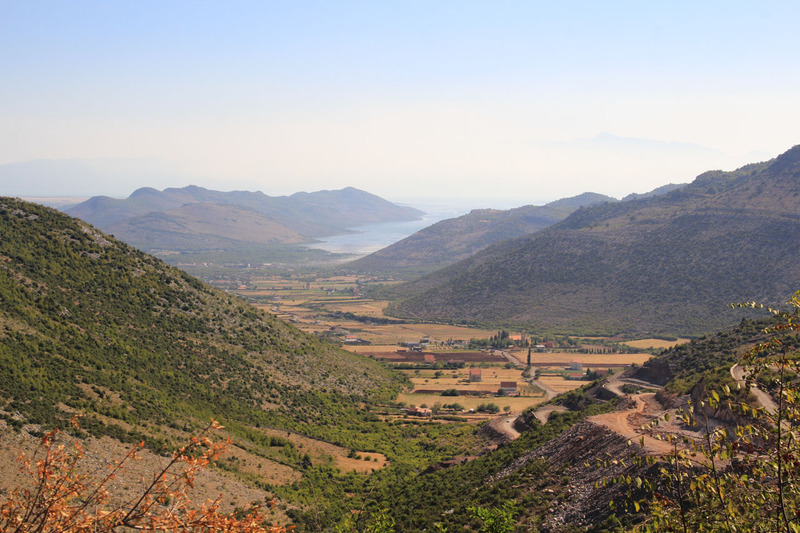 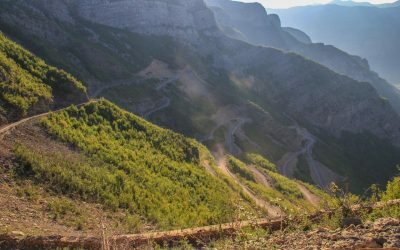 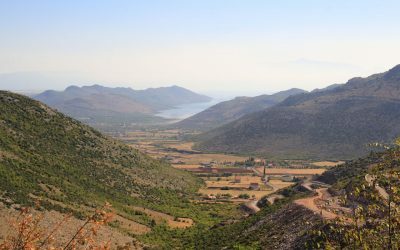 After initial transport to another semi-abandoned village named Cerem, the trail rises to Qafa Borit from where Montenegro is visible. 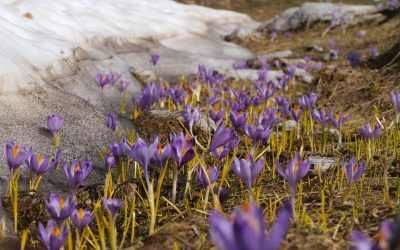 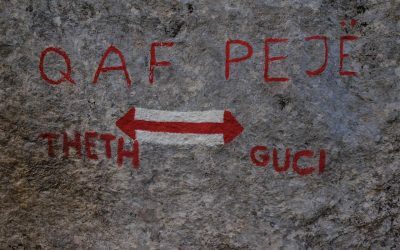 At Qafa Perslopit the guide will decide if the conditions are fit for a summit attempt, three peaks can be scaled. 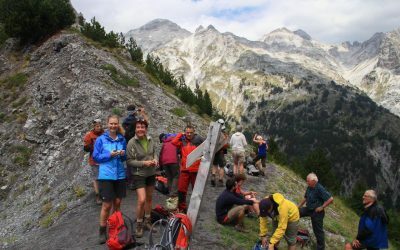 Otherwise the group returns via another pasture stop below the dramatic Mt Thate to Valbona. 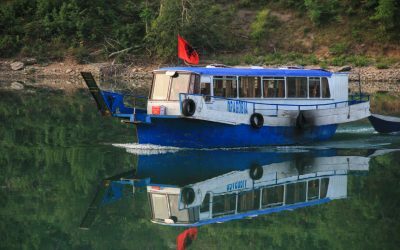 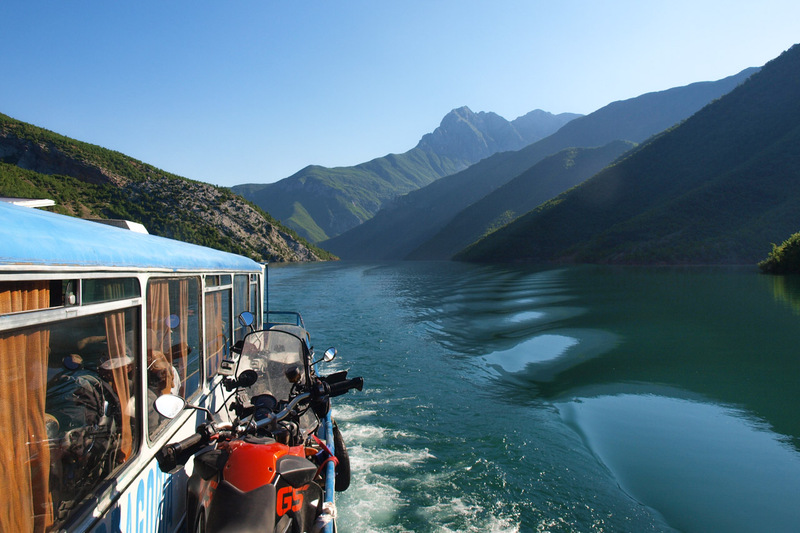 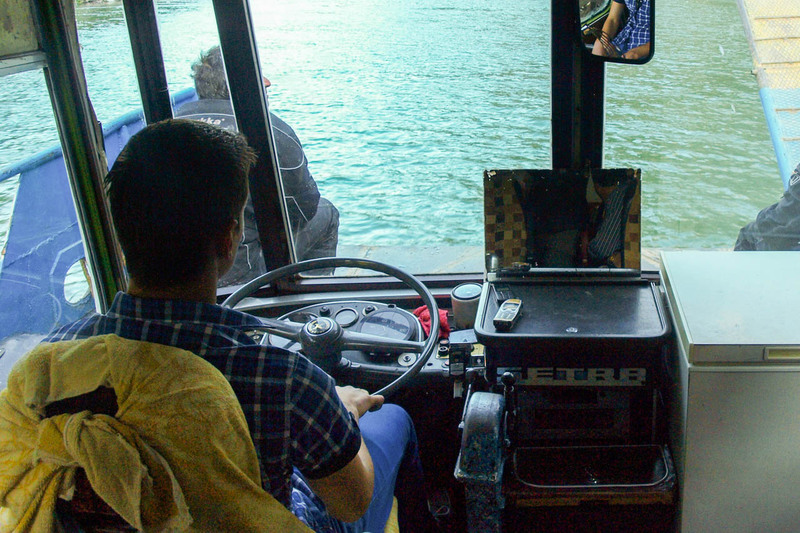 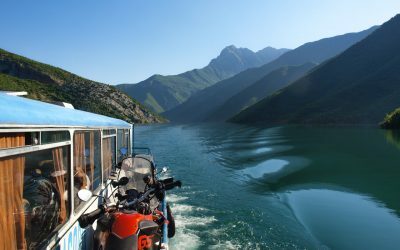 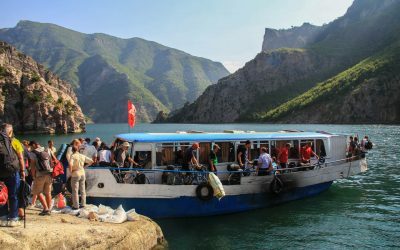 Following a transfer through the Wild East city Bajram Curri we board the Koman Lake ferry in Fierze. 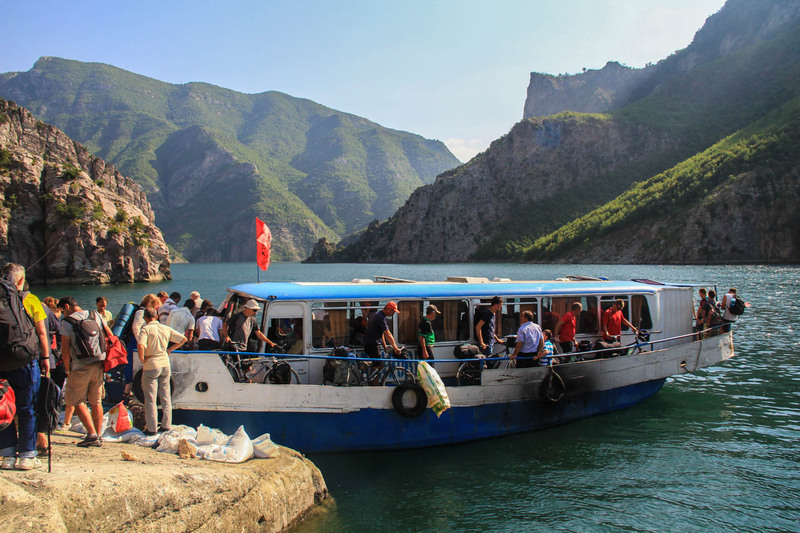 After the stunning ferry ride the capital awaits. 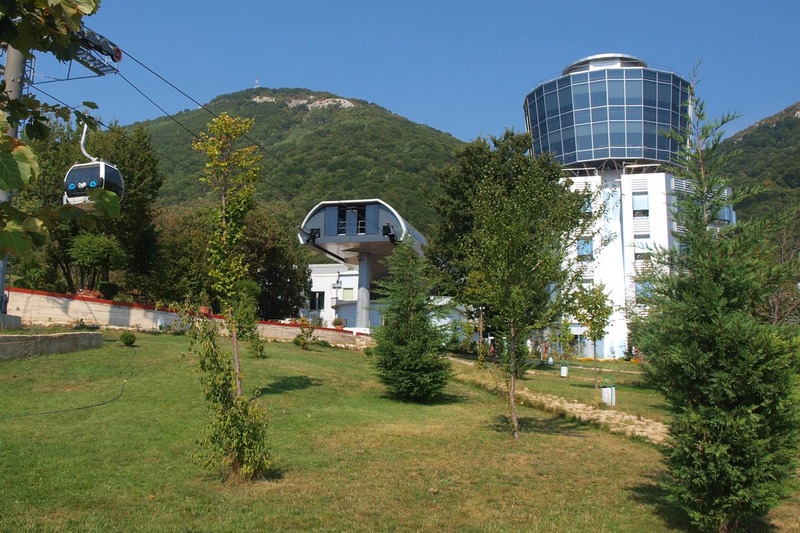 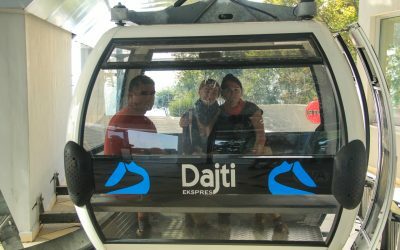 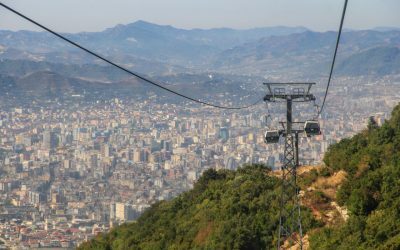 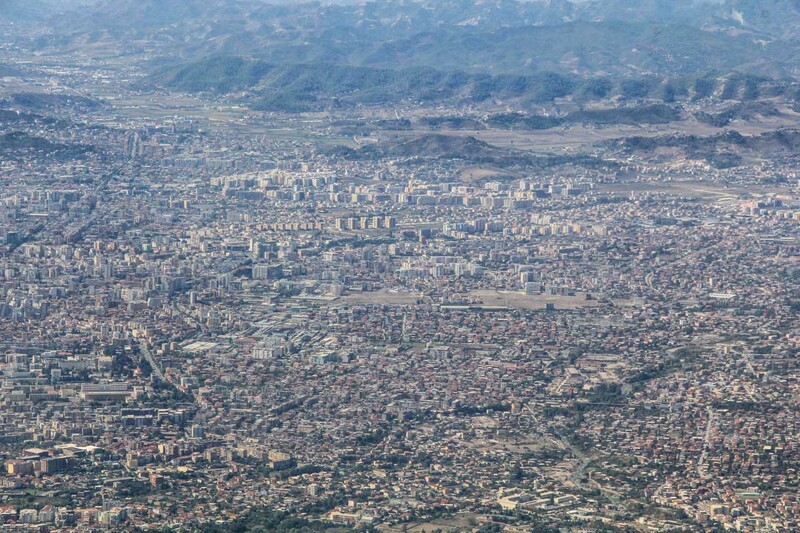 The “Balcony of Tirana” at the upper cable car station offers the best views of the city that will be explored in the afternoon. 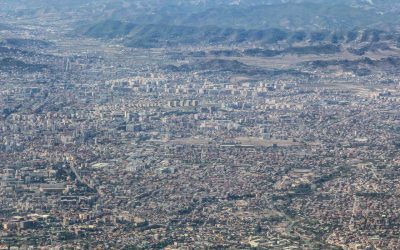 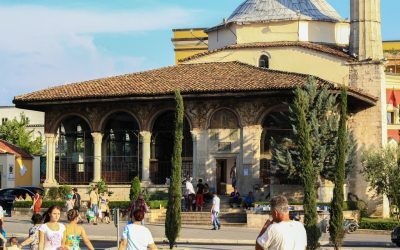 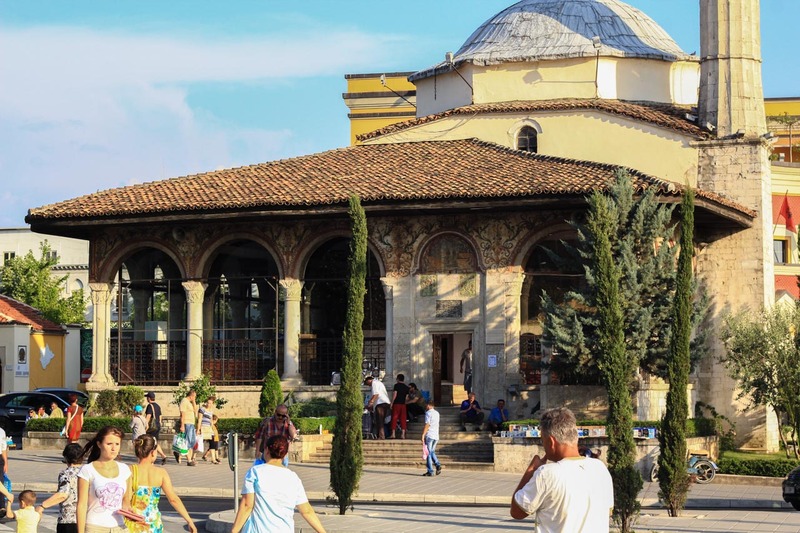 The evening can be spent in upbeat neighborhood “Bloku” – Tirana’s nightlife district, before we say farewell the next day.